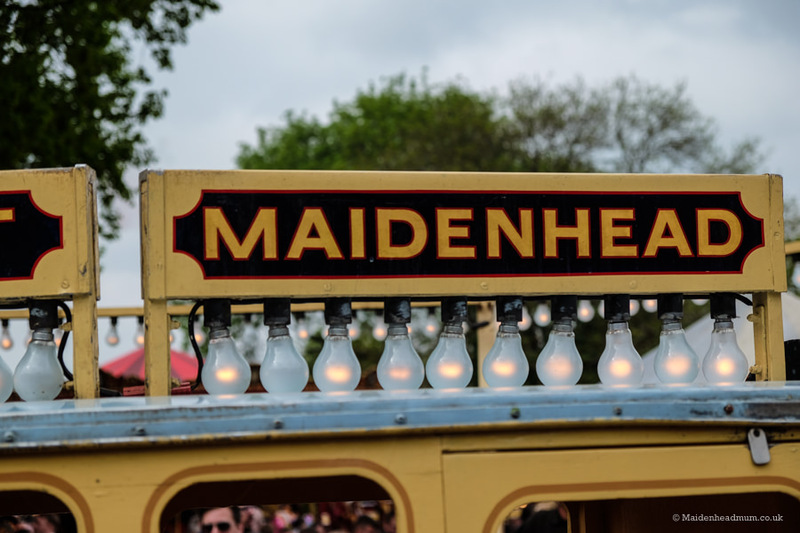 When you have children, or when you have friends and family visiting with children, it suddenly dawns on you that you need some very specific knowledge about Maidenhead. 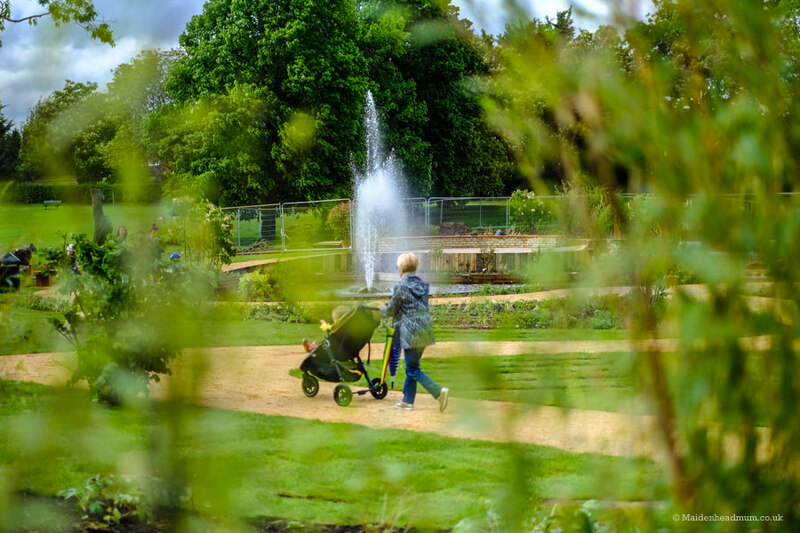 You might know that there’s a park at the end of the road… but where do you go if it’s raining? Or how do you know if the activities are the right level for their age group? 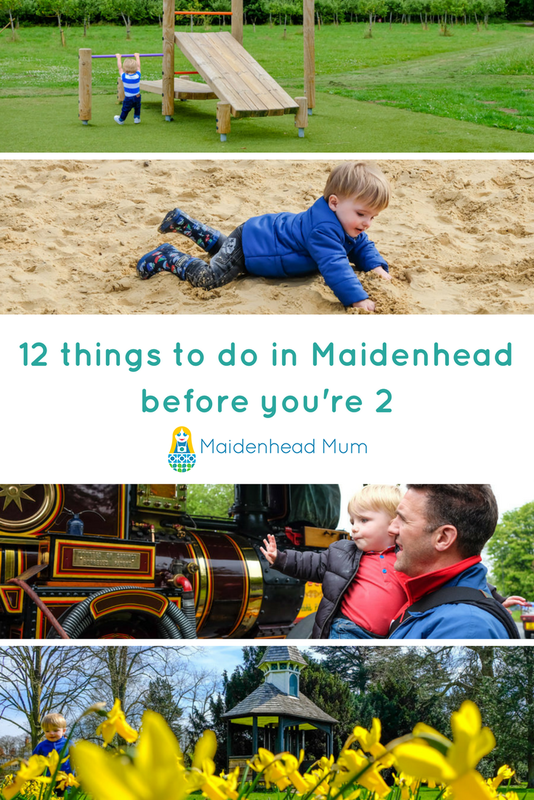 Last year I wrote a blog post covering ‘12 things to do in Maidenhead before you’re one’, where I shared the things that my Little Man and I had done to keep ourselves busy throughout his first 12 months. 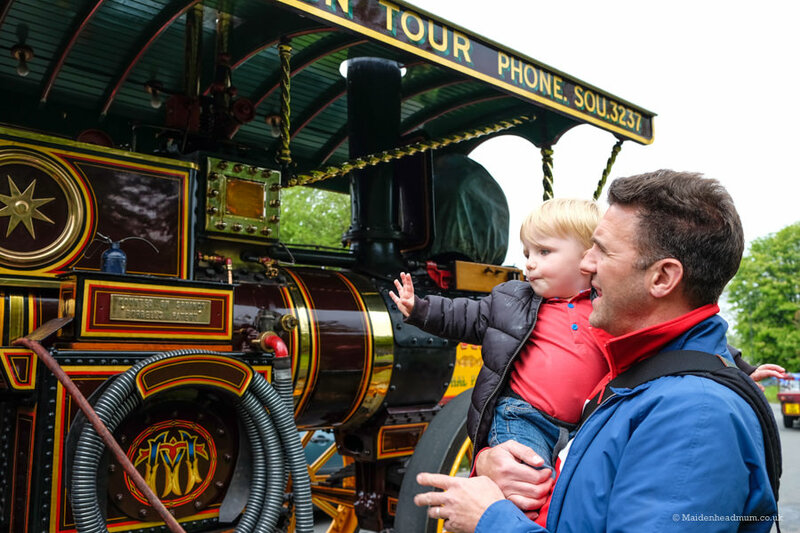 It proved really popular, and it was even featured in the ‘Around The Borough’ newspaper that goes out to all of the houses across Maidenhead, Windsor and Ascot! A little bit of early fame for the wee man. 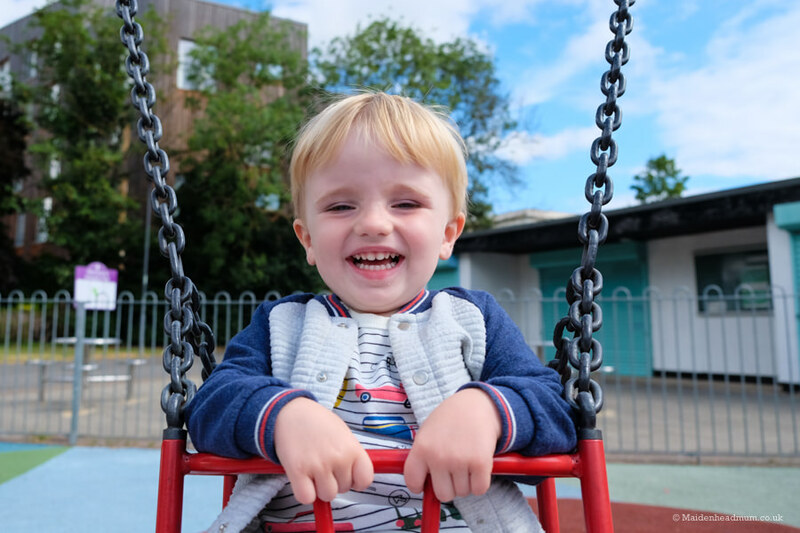 As I find myself a week away from his second birthday, I thought it was high time we shared some of the things that we’ve fitted into the last 12 months. 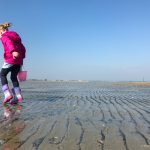 The loyal followers of the blog will recognise that some of these featured in my first round up, but as my son has developed he has found new thrills from the same experiences: even re-visiting an old favourite has bought new joy. 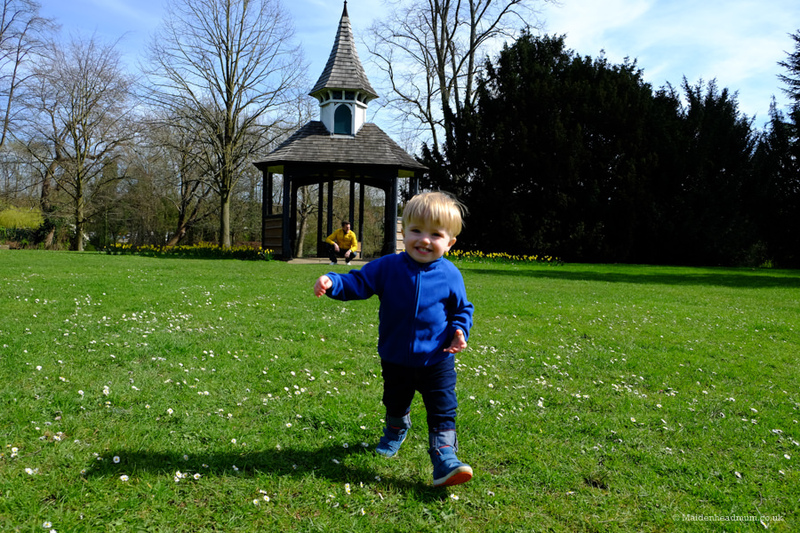 12 things to do in Maidenhead before you’re two. 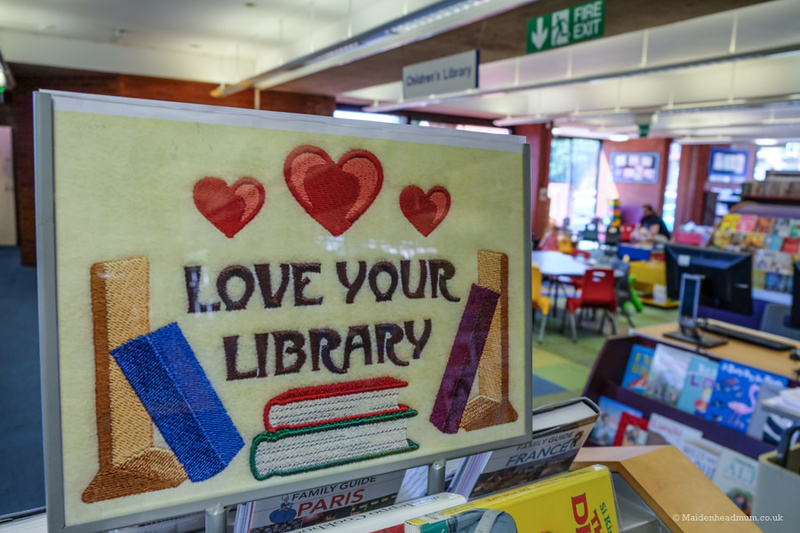 There isn’t really an order of importance or rank to this list, but if there was, I think the library would be at the number one spot for us. 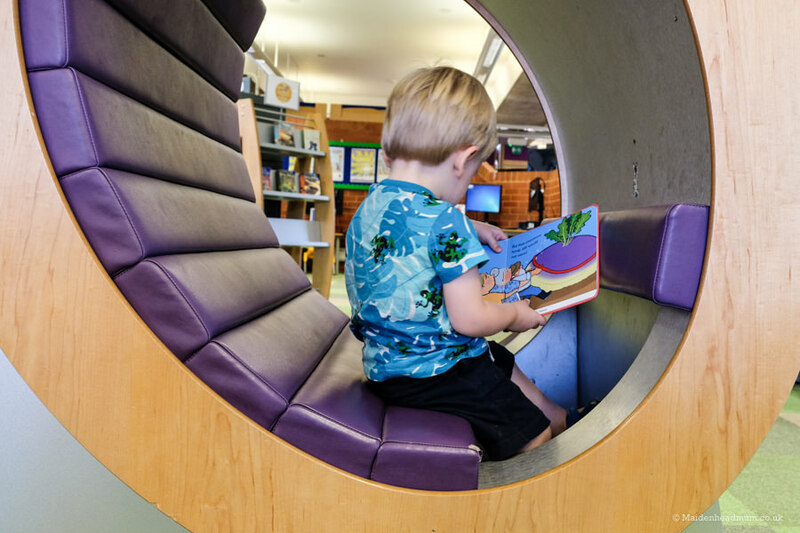 There are libraries all around the borough, and each of them has a bright, funky corner for the little ones. 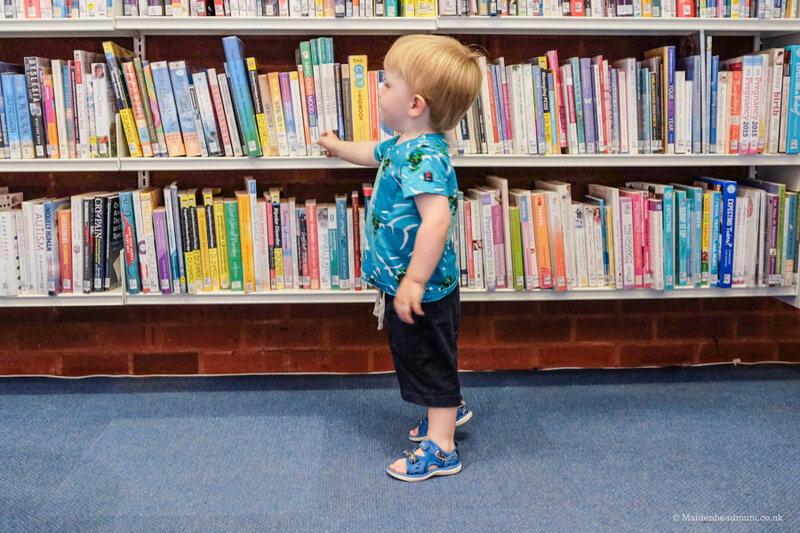 When I had my first child, I saw lots of other mums would go to the library, and I didn’t really understand. These days books are cheap and easily accessible. One click on Amazon and you can have a book delivered to your door. But it’s about so much more than that. He can’t read… but it’s fun trying! 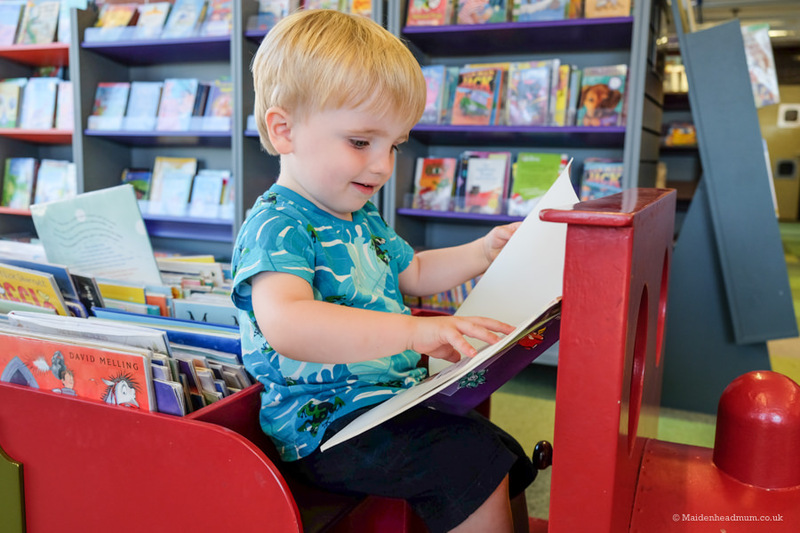 My son enjoys exploring, sitting on the train, building towers and knocking them down, drawing, climbing into a funky seat to ‘read’ a book and ‘making friends’ (or whatever it is that two-year-olds do) with other children. 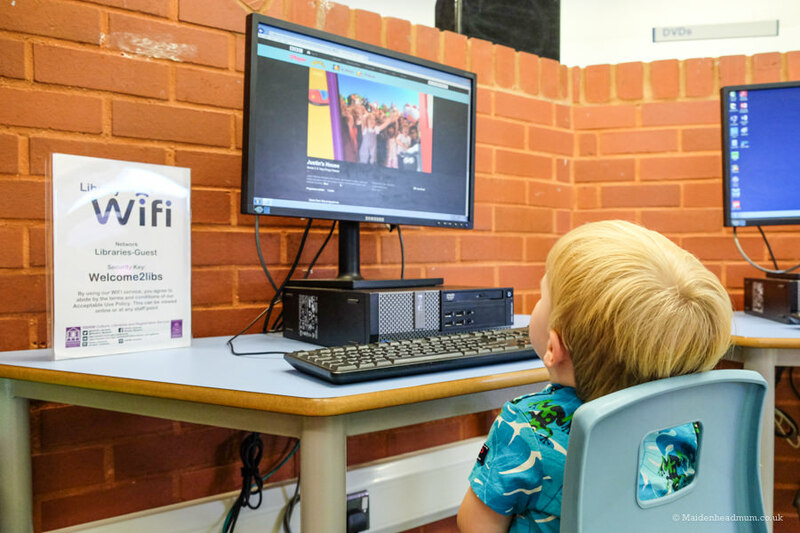 I also have to confess that he LOVES the computer area and is thrilled to sit and listen to Mr Tumble through the headphones. This chair is favourite spot of his. Until he remembers the computers and then he dashes off! The shapes and patterns made by all the ‘grown-up’ books seem to fascinate him. He is fascinated by the computers. All of this is free and available seven days a week come rain or shine. I don’t think there is any other activity in Maidenhead that can claim that. This is a lovely way to while away a summer morning or afternoon. 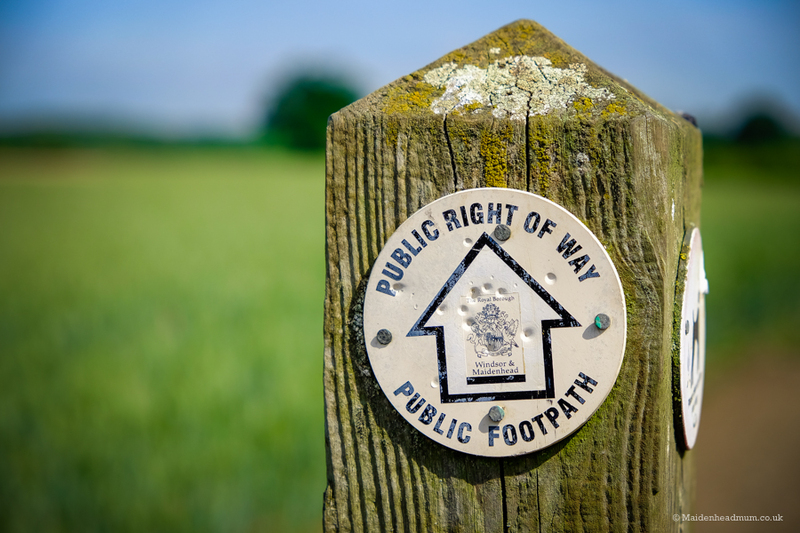 The Green Way is a public footpath that links Bray, Maidenhead and Cookham. We picked the path up from North Town Moor and did a short loop around for a couple of hours. 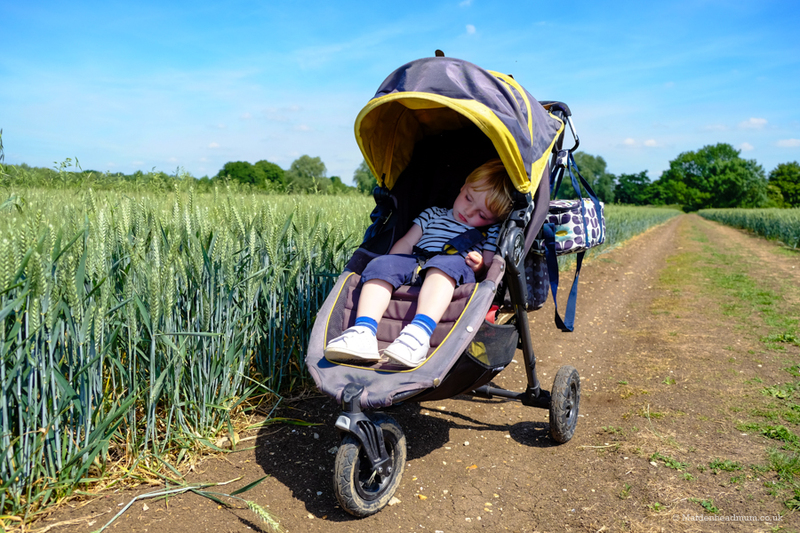 If it’s hot, it can be tiring so make sure you take the buggy in case they need a nap along the way. The best views in the world are on Daddy’s shoulders. The peace and quiet and excitement of running along the paths made someone have a mid morning nap. 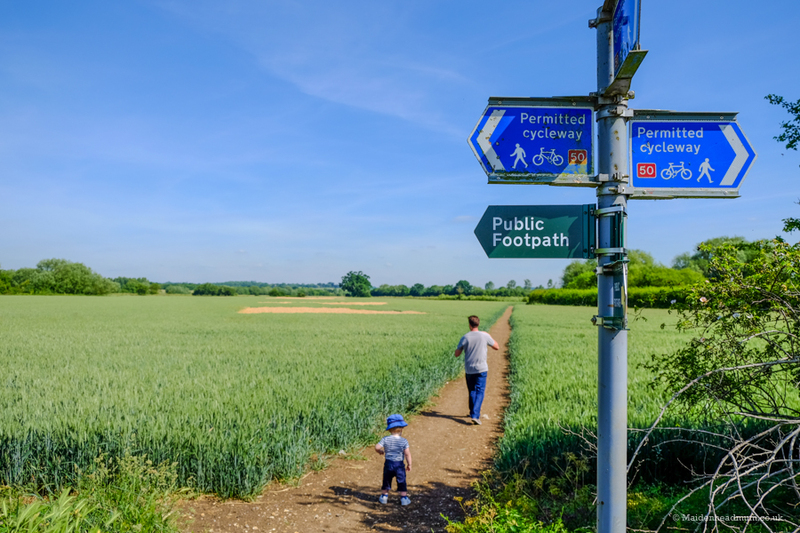 The Public Footpaths are great for toddlers as they are away from busy roads and can explore in safety. 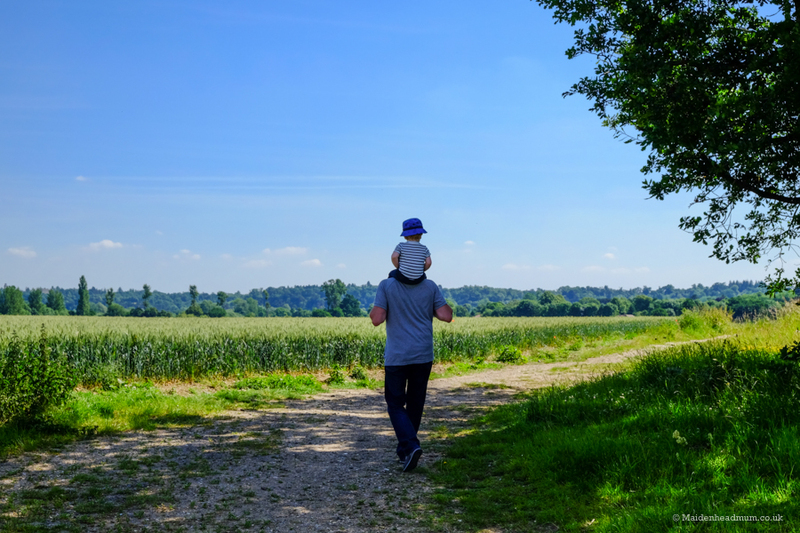 My little one enjoyed seeing the world from daddy’s shoulders, pottering along the footpaths free range, spotting the various dogs that were being taken for a walk, collecting stones and hiding in the corn fields. 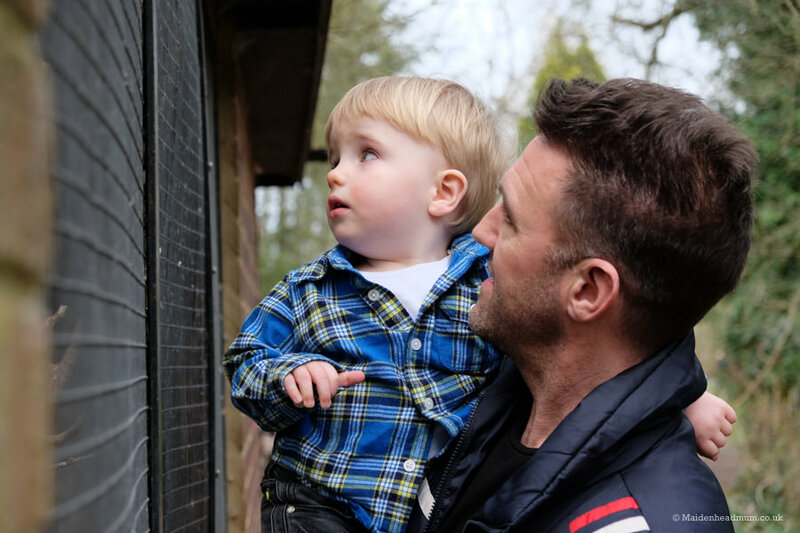 When he is older, I’ll get him doing some ‘flower watch’ and get him spotting some of the beautiful wild flowers that you can see en route. I wrote a post about it on the blog which I’ve linked to above. 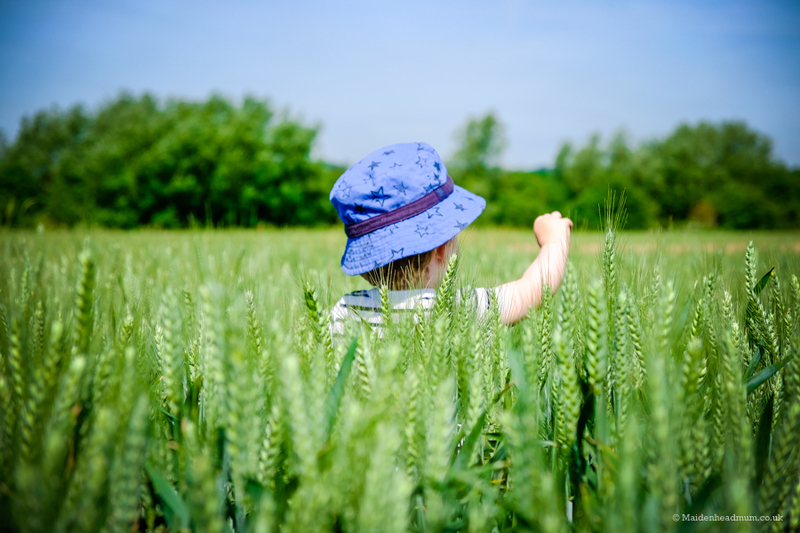 There are little paths in between the rows of corn that my son enjoyed walking up and down. 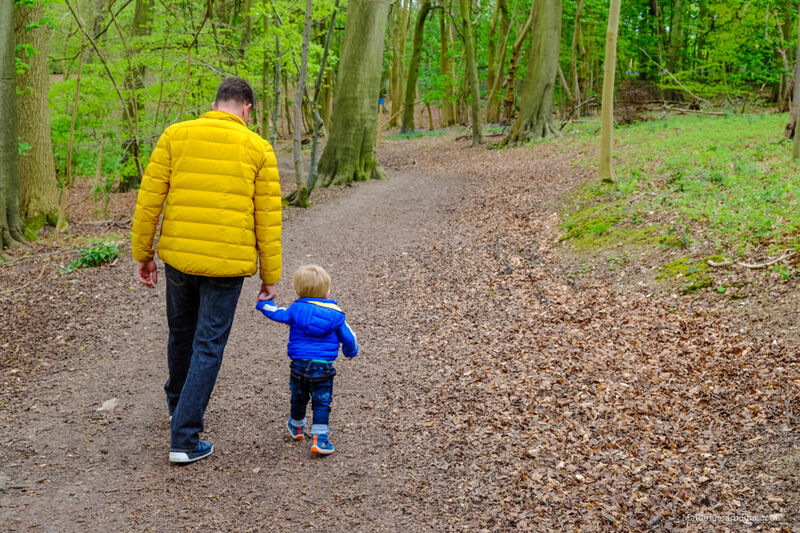 The Green Way has paths that are suitable for a buggy or a bike, but some parts can get muddy in Winter. It doesn’t matter that he has no idea what he is doing, the fun is in the trying! 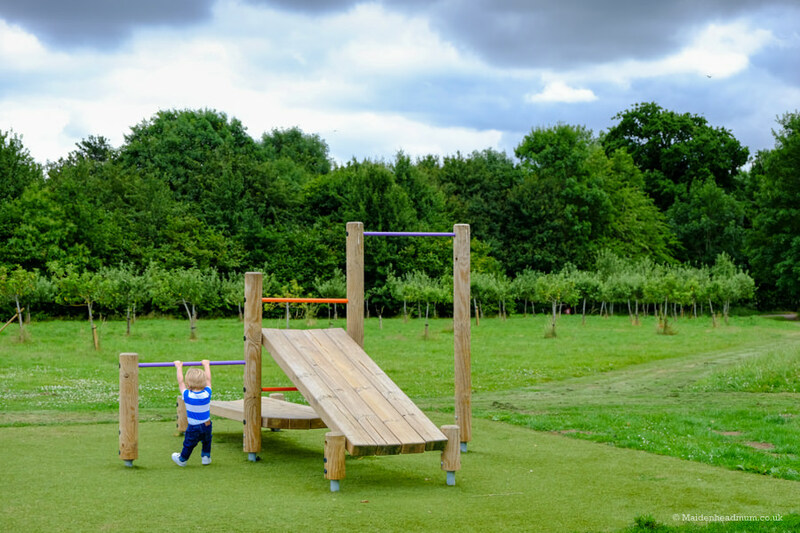 Up towards Cox Green, Ockwells Park has around 44 acres of open space which includes a children’s playground, nature trails, woodland and a fitness trail. 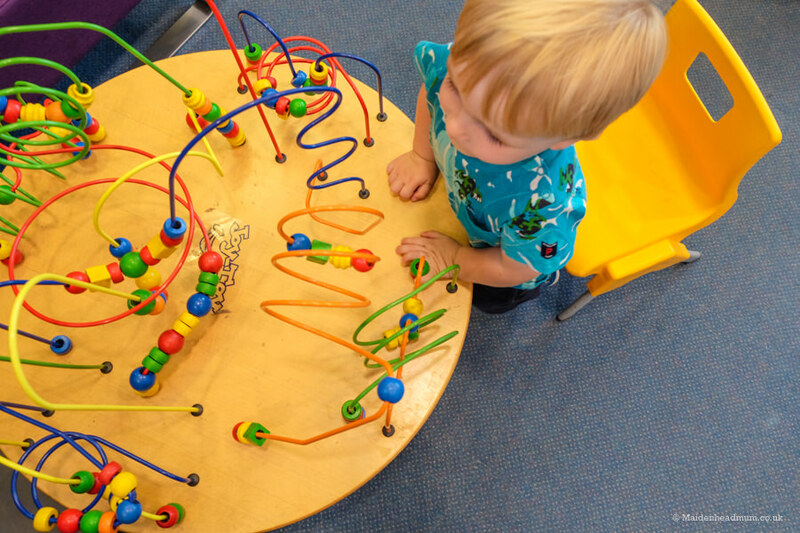 There is even a café and an indoor soft play for when it’s raining in the week (this tends to be booked for parties all weekend so check before you go!). There’s so much to do at Ockwells that it features twice in my list as sometimes we choose to just visit one part of it. 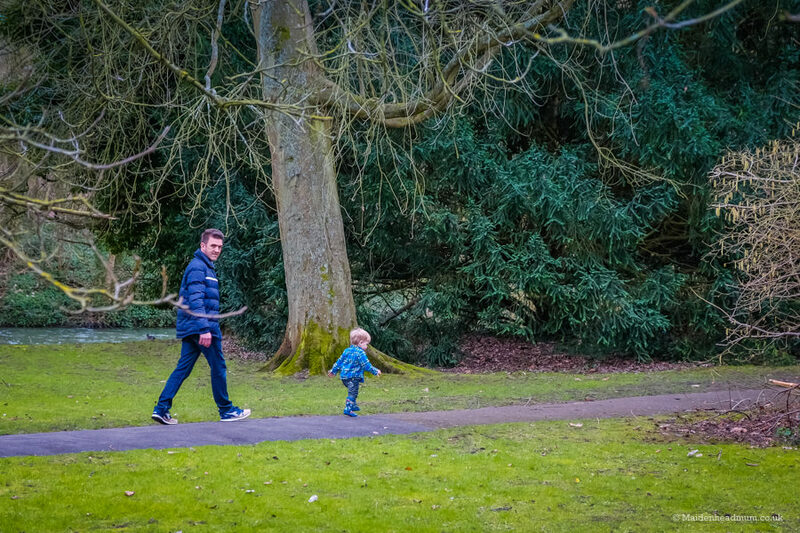 A keen favourite with my son at the moment is the Fitness trail which loops around the park from the corner of the car park by the Pavillion building. 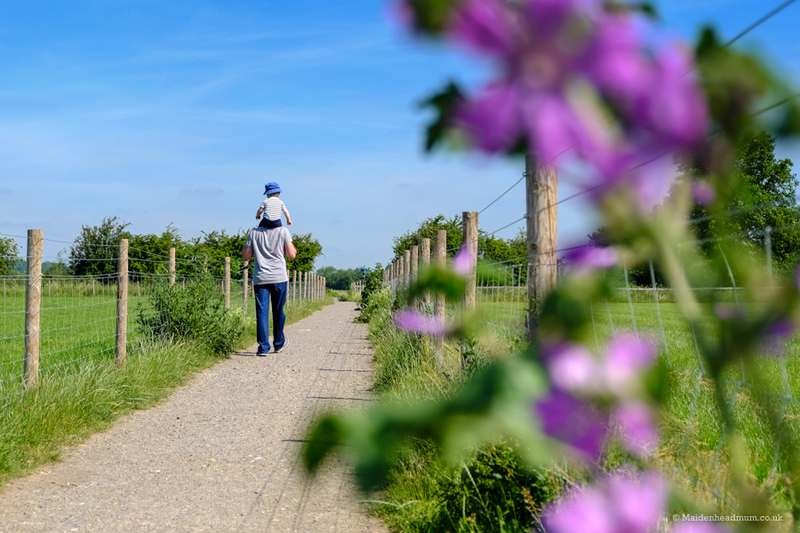 This path was also a firm favourite with my daughter when she was learning to ride her bike as she could pedal a short distance to each bit of equipment and I had peace of mind knowing we were safe and away from busy roads. Lots of platforms for little legs to climb on. 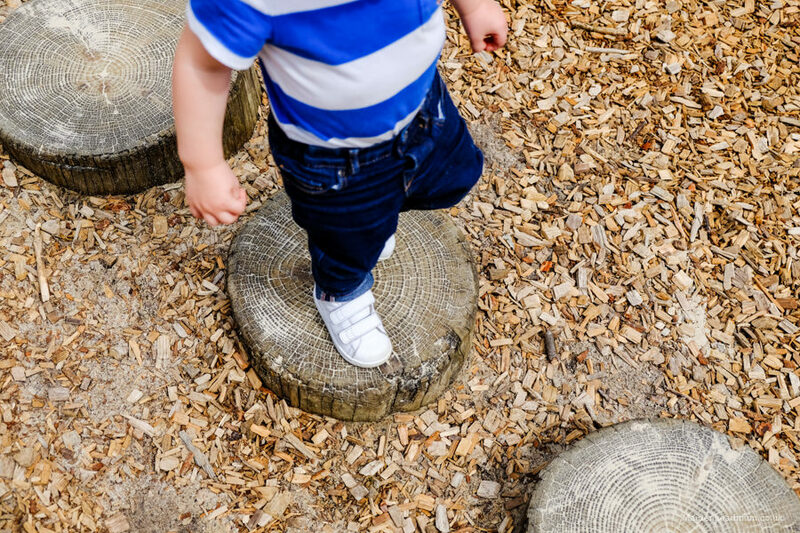 He’s totally fearless: happy to climb right to the top if we let him! Off he goes again on his little legs! 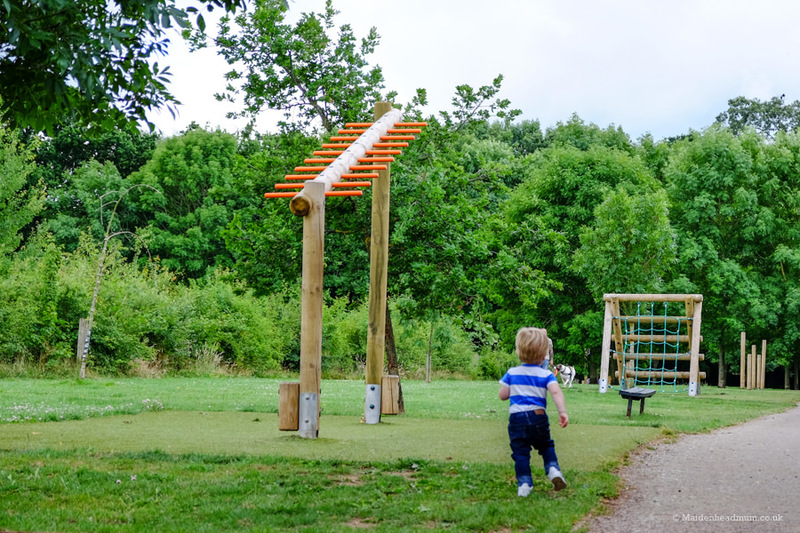 Currently, my son likes to run along the paths, he looks out for the planes that circle overhead from White Waltham airfield, he likes to try and climb up, under and over the equipment and of course, he likes to stop and collect stones. 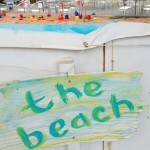 (This started on a pebbly beach in holiday in Pagham and has continued EVERYWHERE we go since then!). There are also lots of dogs to spot here too. Time to stop and collect stones and rocks. He likes to pick them up and then find somewhere to arrange them. Perhaps we have a budding geologist in the making? I love that the fitness trail’s just a 5-minute drive from my house and that there is lots of easy parking at Ockwells. We can nip there and happily kill an hour or so there walking around, and it’s totally free! 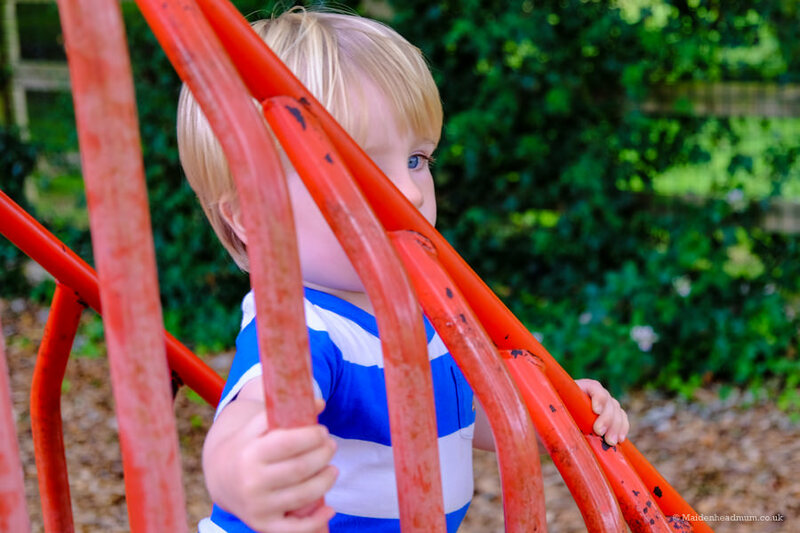 I also find watching him try to do his exercises more fun than hovering around in the park while he explores and climbs. Sometimes we manage to just do the fitness trail on it’s own, although now he is getting wise to that and shrieks ‘park’ as we are half way around the path and then shoots off across the field to get to it! Talking a walk with Nanny to see the fountain. You can just about see his little fingers pointing! 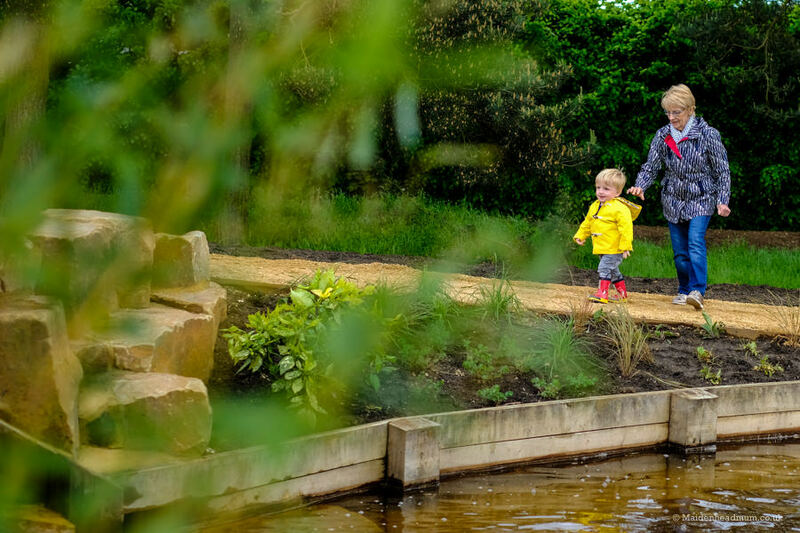 The Nicholas Winton Memorial garden is a beautiful new addition to Oaken Grove Park which already has an excellent play area and lots of open space. 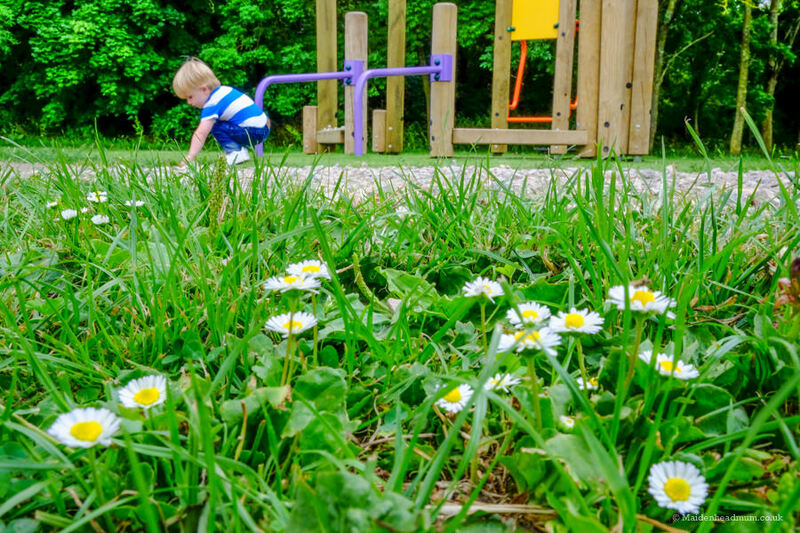 You need to be aware that the garden is meant to be a place of reflection and as such, it’s not built with toddler safety in mind. 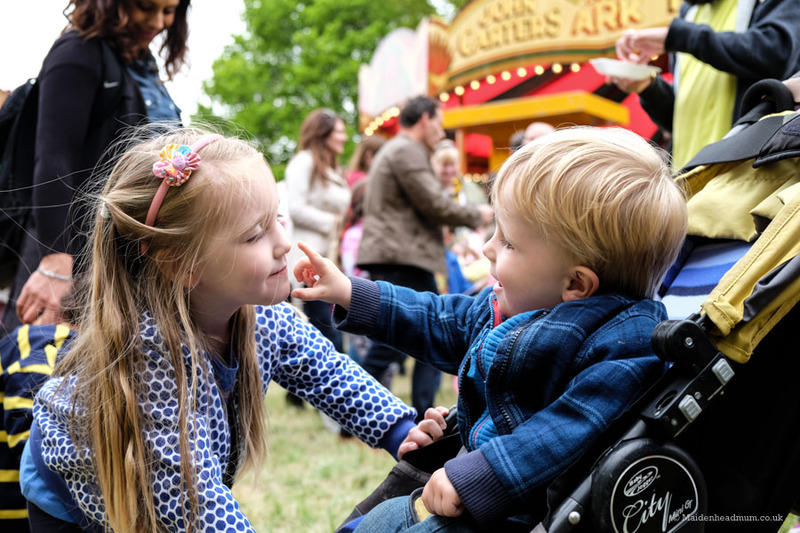 But, there is plenty to inspire there if your little one is happy to sit in the buggy, or to hold a hand of a grown up. You need to keep a close eye on the little ones as there is open water here. 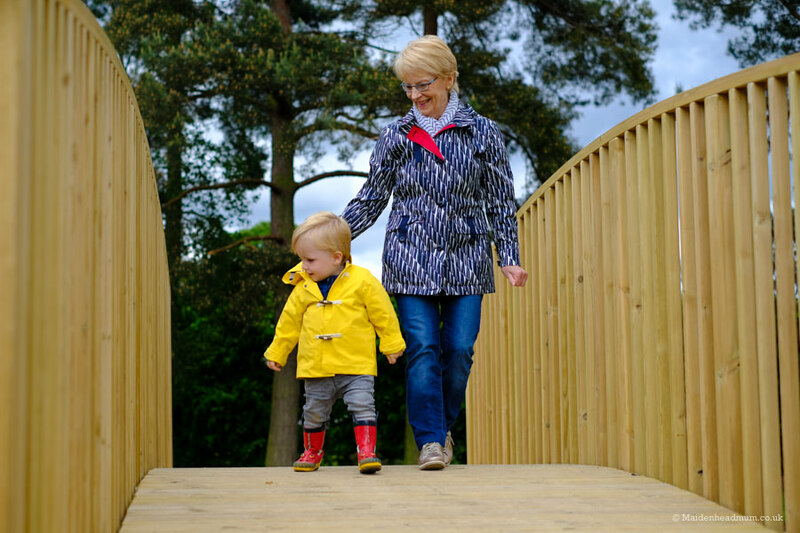 My son enjoyed seeing (and hearing) the fountain, climbing over the bridge and leading his Nan on a walk around the garden. 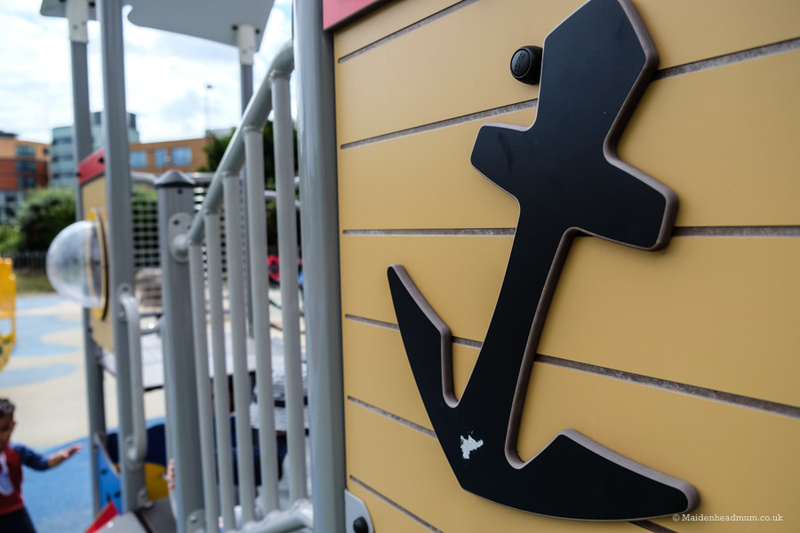 When you’ve seen all that you want to see in the memorial garden, the play area is a short walk away, and you’re spoilt for choice with things for the little one’s to play on. 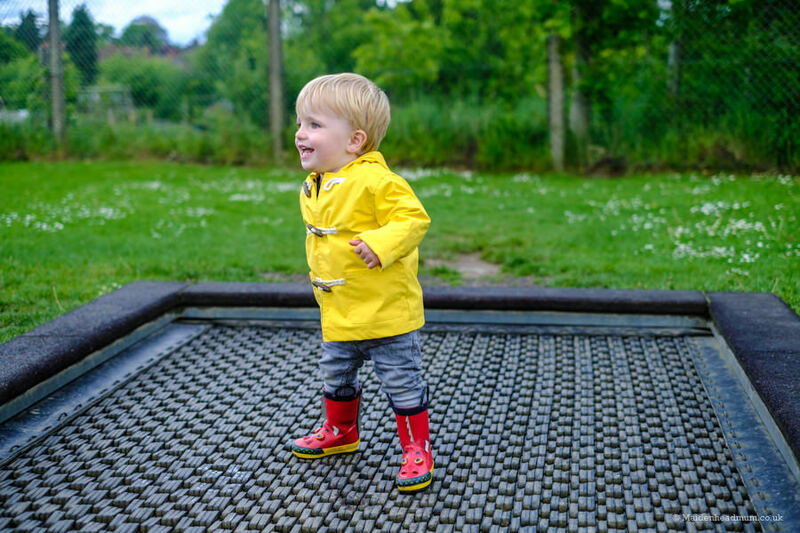 The trampoline at the bottom of the play area is always a win, and it’s only now as he is nearly two that he can jump hard enough to make it bounce! 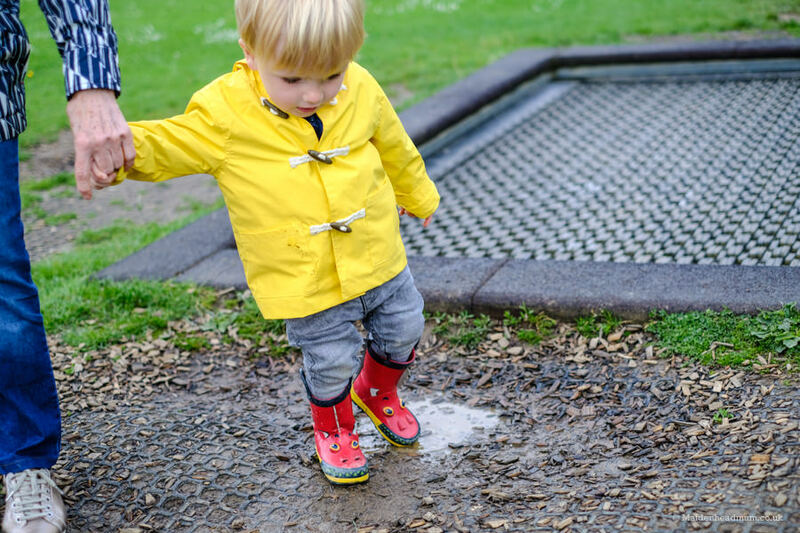 Watch out for puddles in the park if it’s been raining! 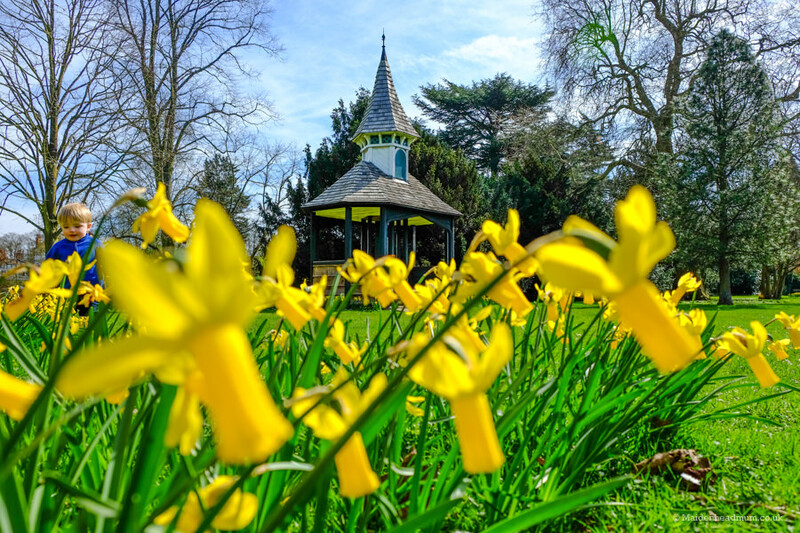 Although Maidenhead is technically a river town, we’re slightly different to most in that our town centre and Riverside area are so separate. Guard’s club park is a beautiful little open space, right by the Thames and Brunel’s amazing Railway Bridge. 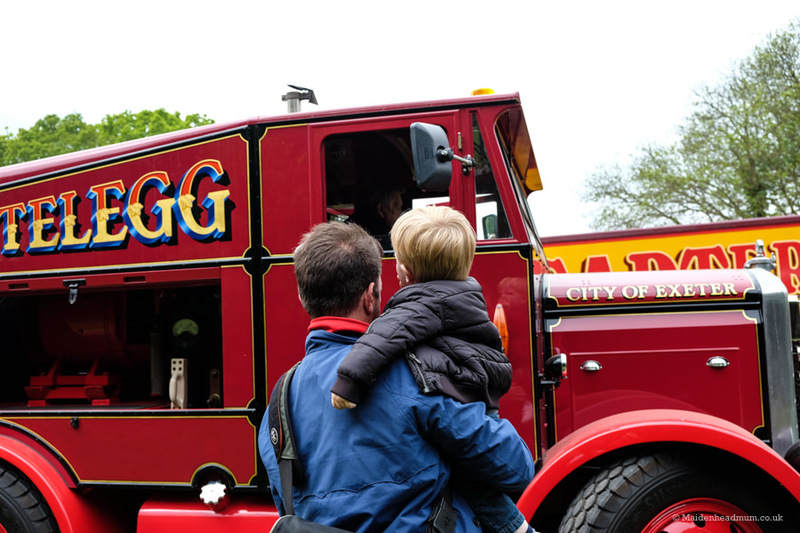 If you have a train enthusiast in the making, then they will love hearing and seeing the trains rush past! Can you see him hiding?! 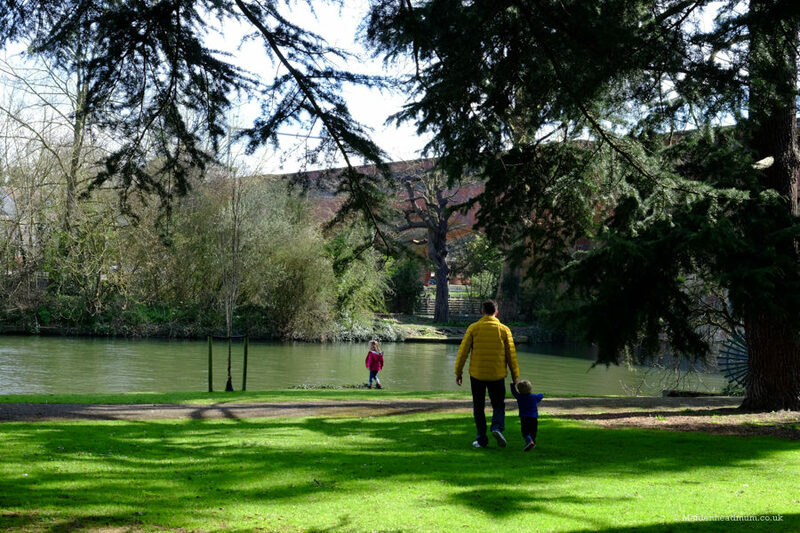 The park is a good place to take a picnic, and you can also get close to the river and feed the ducks. 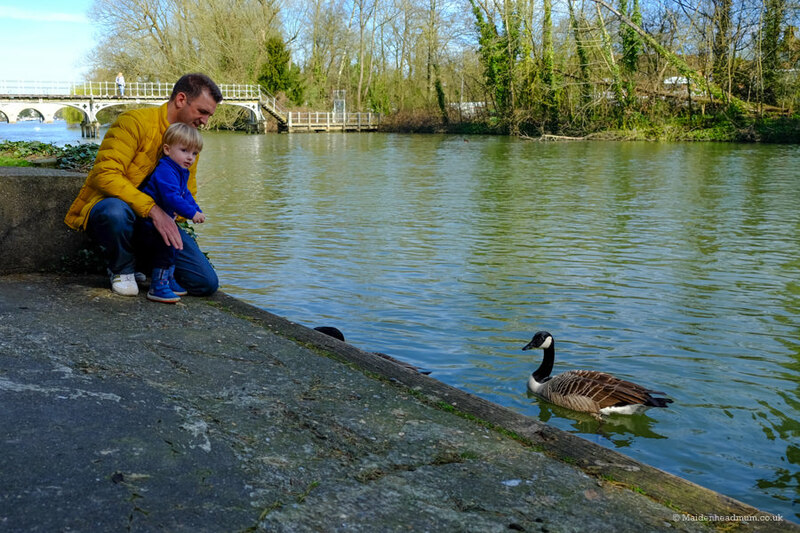 I prefer to go as a family if we are feeding the ducks and geese, so it’s easier to keep control of the Little Man. 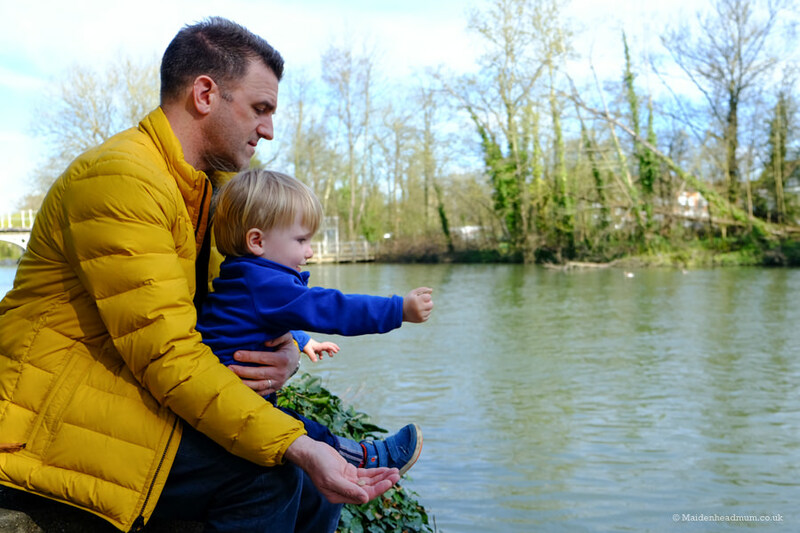 Toddlers can run very fast, and often in a completely unexpected direction which doesn’t bode well when the river is so close, so please be careful! You can see Brunel’s Railway bridge right next to the river which is great for train spotting. In the background you can see a white bridge which used to have eel traps underneath it when it was built. 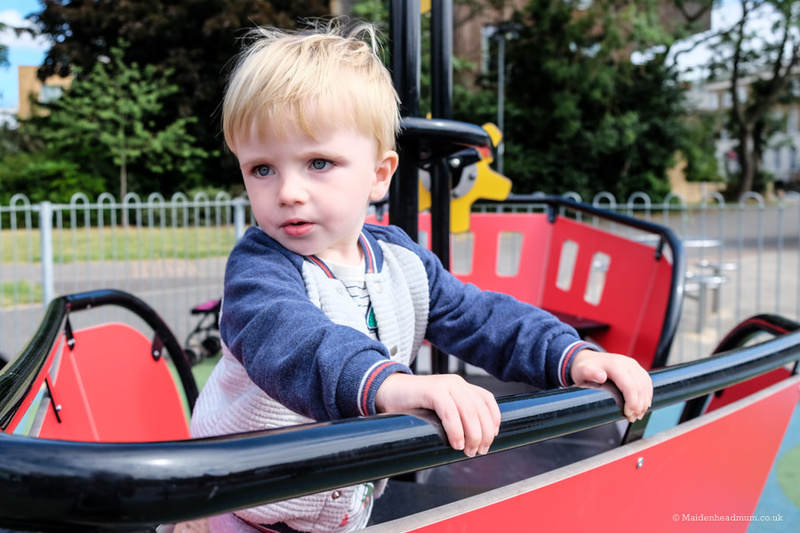 For the first twelve months of his life, a visit to Guard’s club park meant that my son was ‘pushed around’ in the buggy, admiring the view and feeding the ducks. It’s all changed now though! 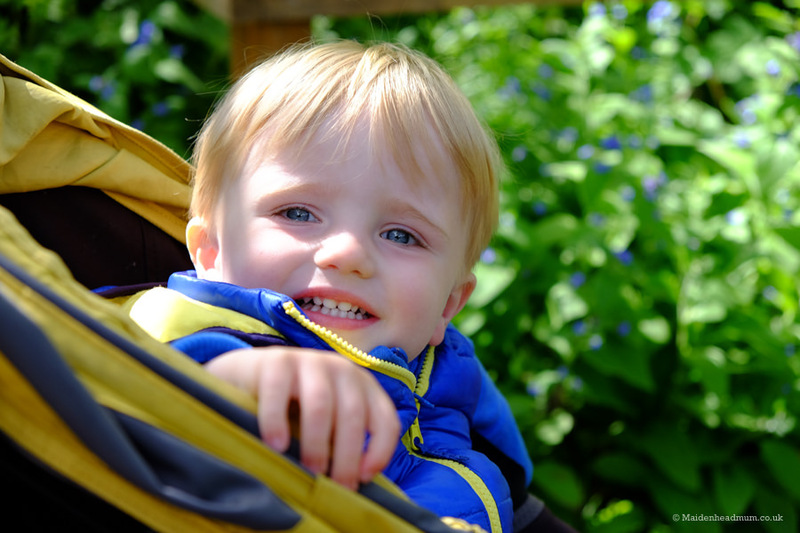 My son currently enjoys feeding the birds and chasing his sister around the grassy area of the park. 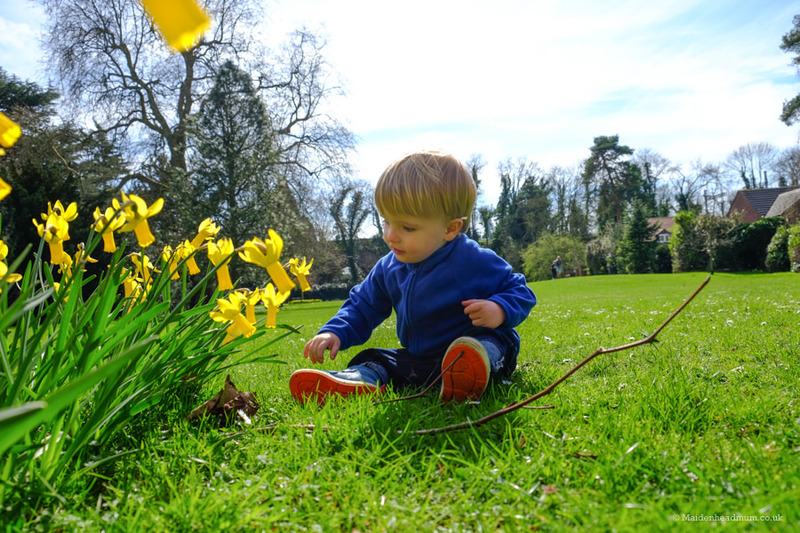 He was also quite taken by the daffodils in spring which were planted by the resident’s association. 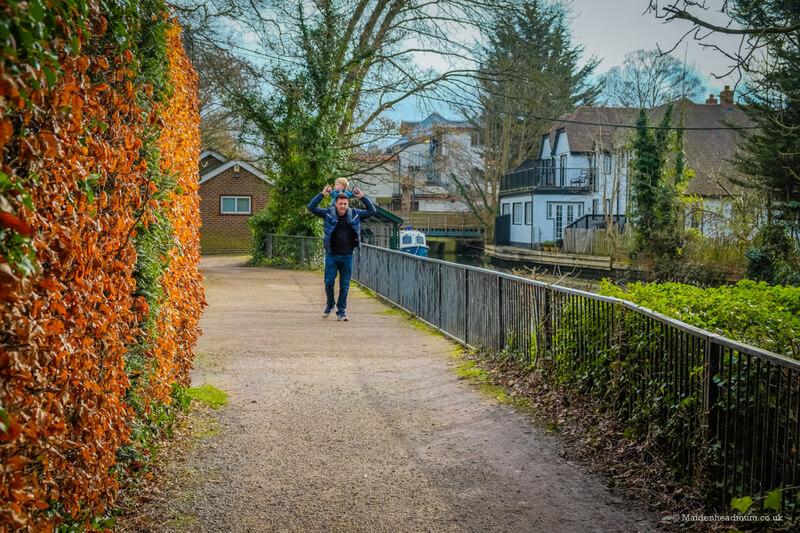 When he is older, we will walk across the white ‘eel bridge’ to the small island in the centre of the river which is open at certain times of the year (closed during nesting season to protect the birds). In the center of the park there are wide open spaces, perfect for running around and letting off steam. He was fascinated by the bright colours. There is a small car park (for around eight cars) which you can access from the gate at the bottom of Oldacres Road. As a side note, Guard’s park recently had it’s first ever Gin Festival. Keep an eye out for another one next year as it’s something that the whole family can enjoy. 6. Run, jump and crash land in safety. 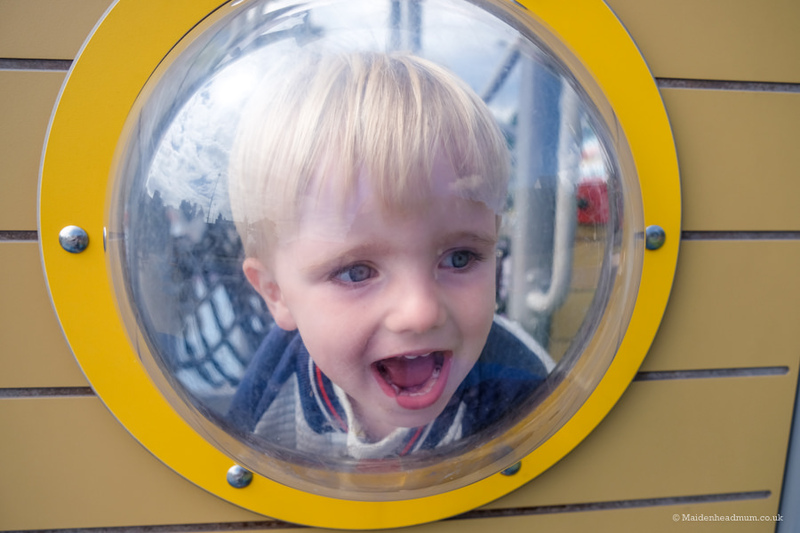 Phoenix Playgym is a magical space for the under 5s. 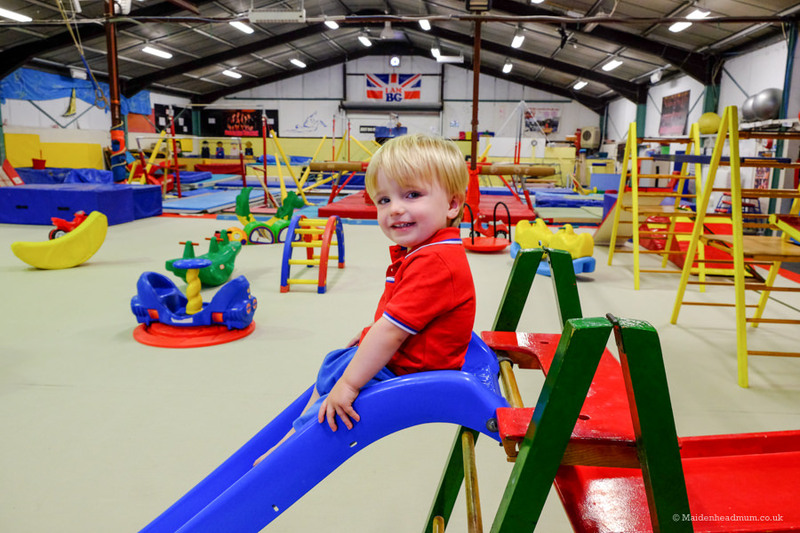 Phoenix Playgym featured in my round up of ‘things to do in Maidenhead before you’re 1’, and it is a firm family favourite. My five-year-old daughter even chose to have her birthday party here this year! 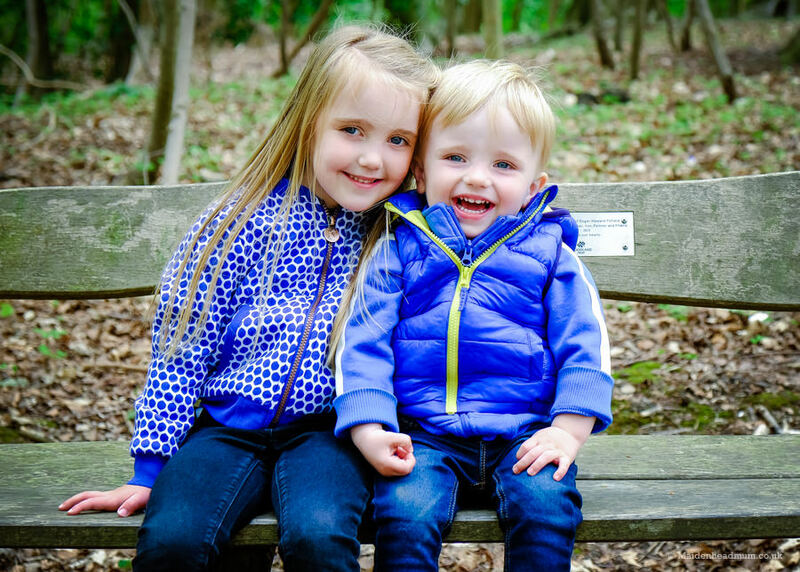 When my son was younger, I loved the fact that the gym offered a safe crawling environment while his sister ran around having equal amounts of fun as him. Now he is older, stronger and ridiculously fearless so there is no stopping him. 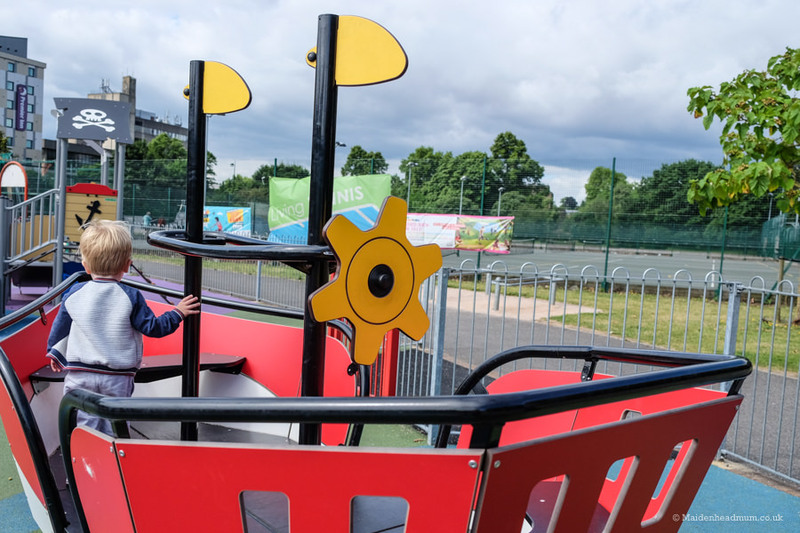 When it’s too hot or too wet for the park, Playgym is a great alternative. We went on a hot sunny morning and had the place to ourselves! Styling it out. He actually has no idea how to get it moving! 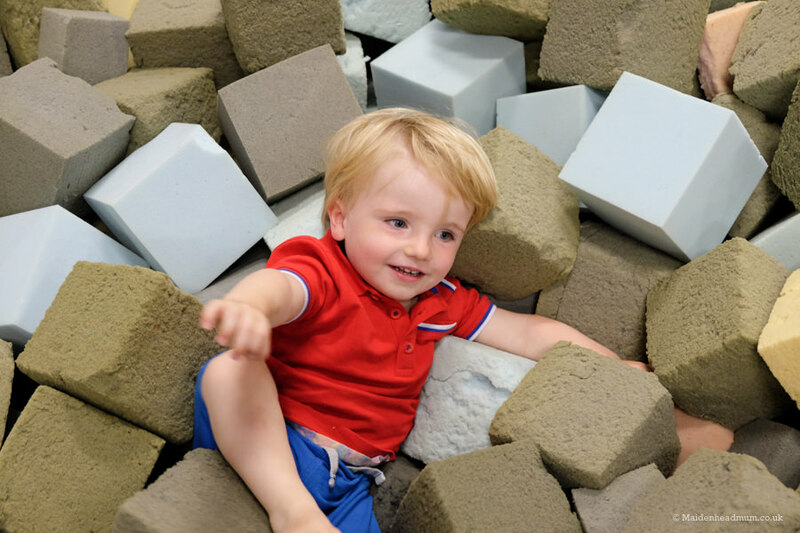 You can jump and crash land into the foam blocks…or you can build a tower with the blocks. There is always a little one building a tower whenever I go! 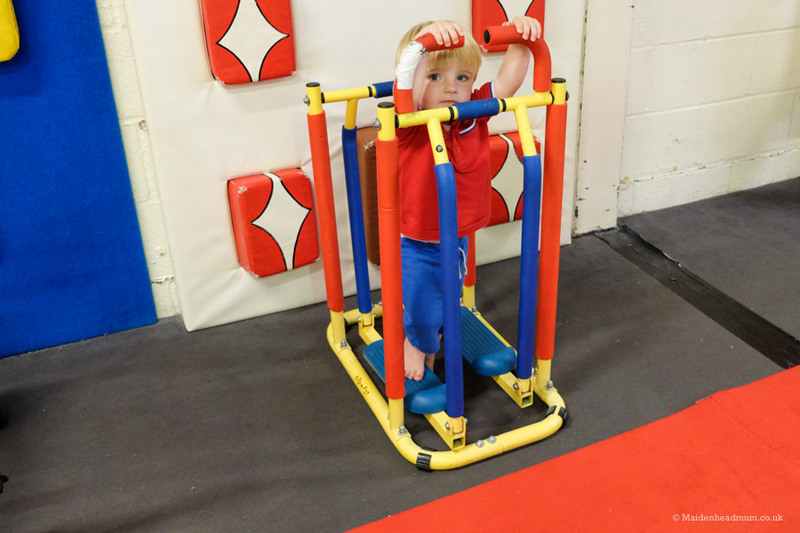 He currently enjoys climbing on everything he can reach, jumping on the trampoline, building towers from the foam blocks and trying to figure out the mini fitness exercise equipment. At my daughter’s birthday party I was amazed by how many of the dads had no idea that Phoenix Playgym even existed! It was great to see them helping the kids use the equipment. Much more interactive than the park. 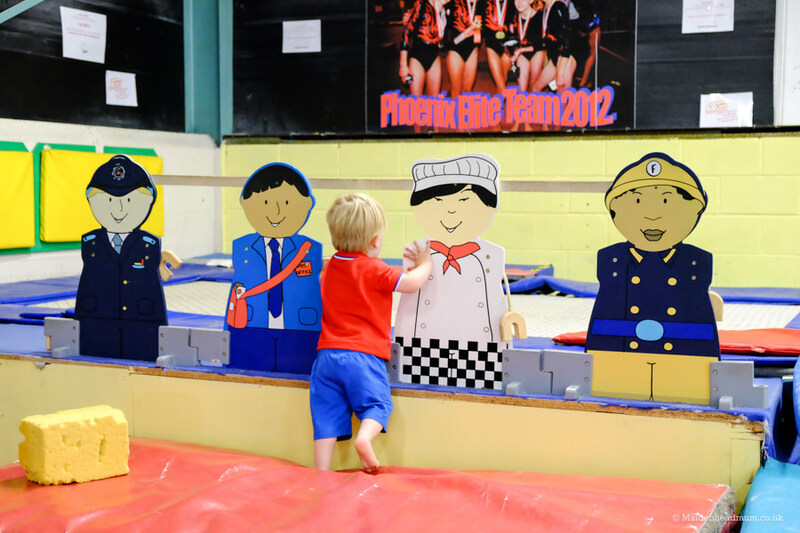 The Playgym is open weekday mornings and selectively at the weekends too. Keep an eye out for weekend dates on their Facebook page. 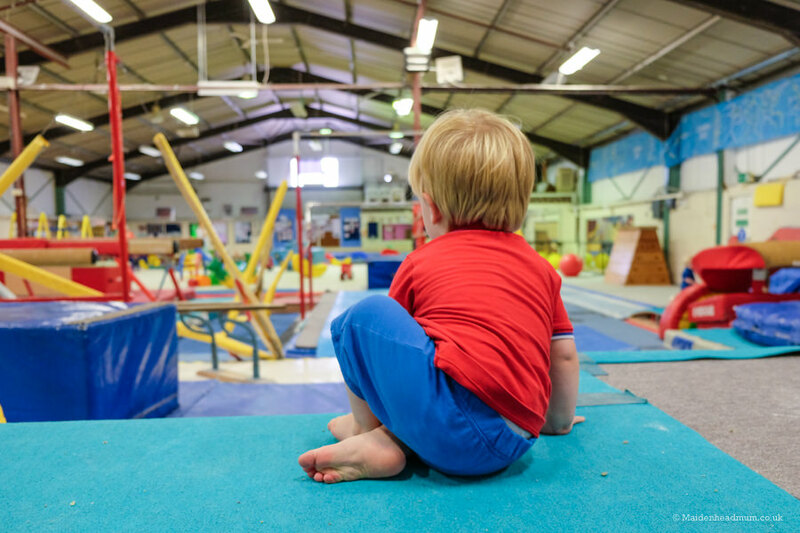 I wish, wish, wish, it was open every weekend as we would be regulars, but I totally understand the need to support our local gymnasts with a space for them to train and coach in. 7. Find your ‘swashbuckle cheer’ on a pirate ship. 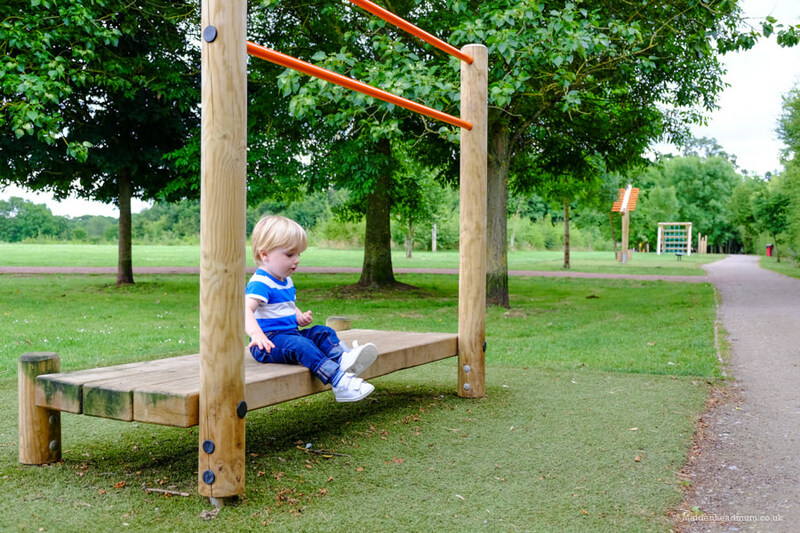 The play area at Kidwell’s park is small, but perfectly formed for early walkers and toddlers. 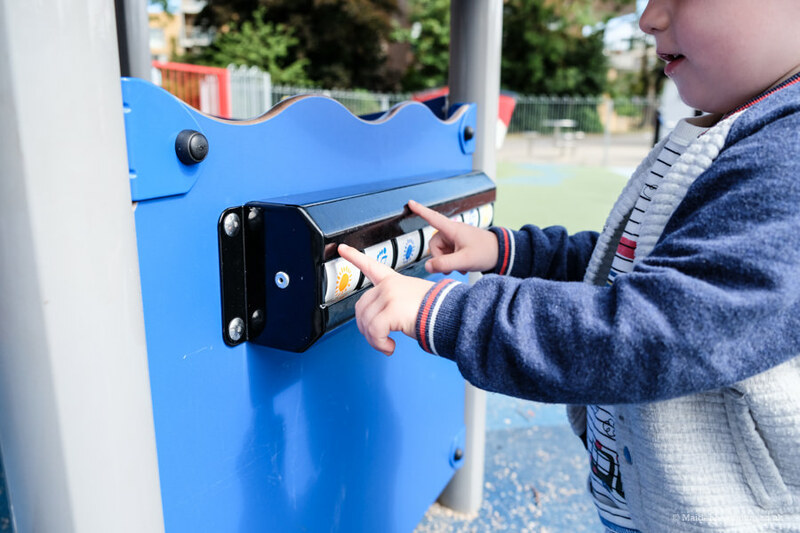 A lot of the play equipment has interactive dials and cogs to turn which are all low enough for little ones to play safely with. It’s in an enclosed area too, which means that they are less likely to run off into the distance. 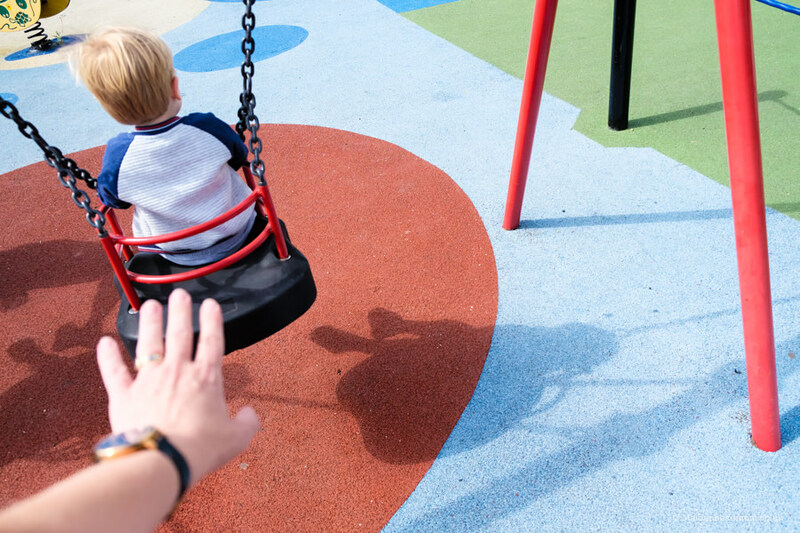 We sometimes forget about this playground until it’s Maidenhead festival time, but it’s a great way to while away the time and break up a shopping trip. 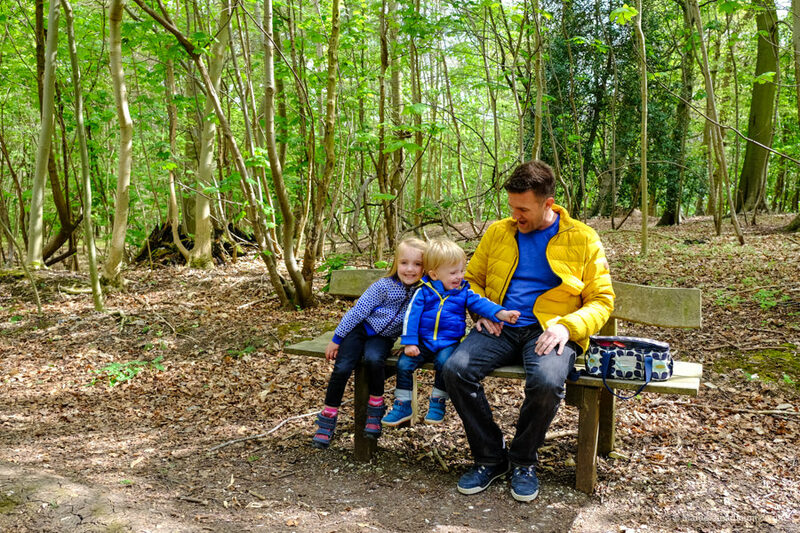 The only downside is that I haven’t seen the café or toilets open yet this year, so go prepared with a picnic, or stop off en route for a loo break or nappy change. 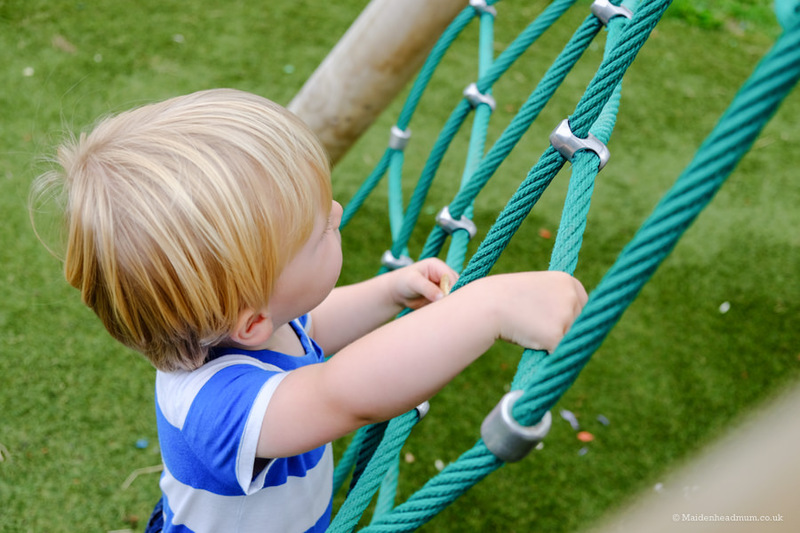 The little man enjoyed climbing into the Pirate ship, peeping through the portholes, the swings, and the little activities hidden under the climbing equipment. There is a Pirate ship that they can climb into which rocks and sways. Under the play equipment there are little activity toys at toddler level. He loved the swings. Always a win, whatever the age! It’s not just stones that he likes to collect: it’s sticks too! You can do a woodland walk anytime of the year, and the thrill of pottering around and finding big sticks will always be there. 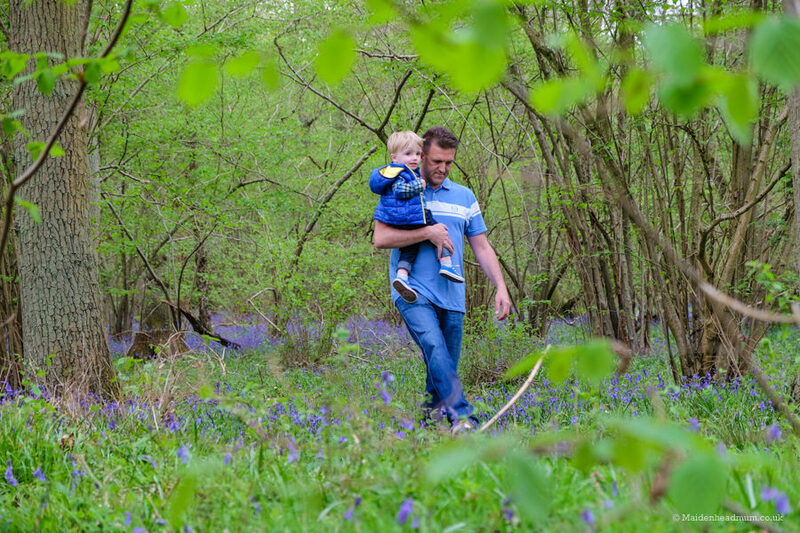 But in April and May, these woodland walks are extra special as the woodland is filled with beautiful bluebells. 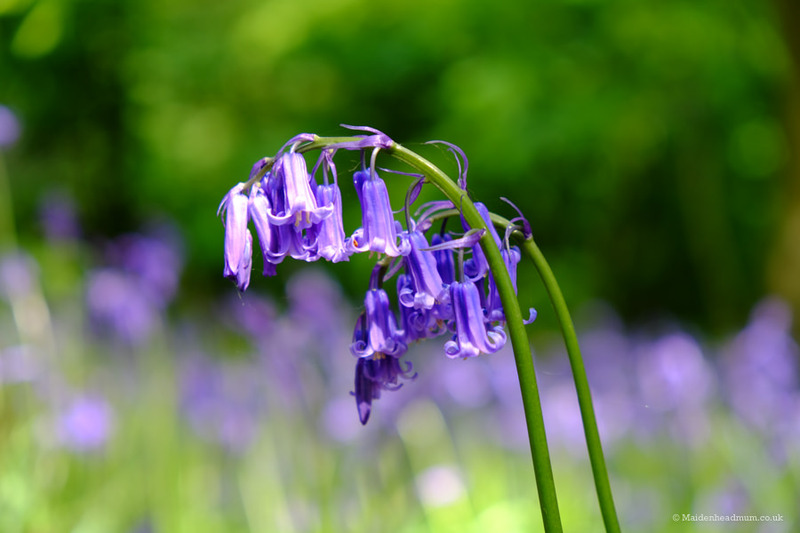 Bluebells in Thrift Wood, a new woodlands area at Ockwells Park. 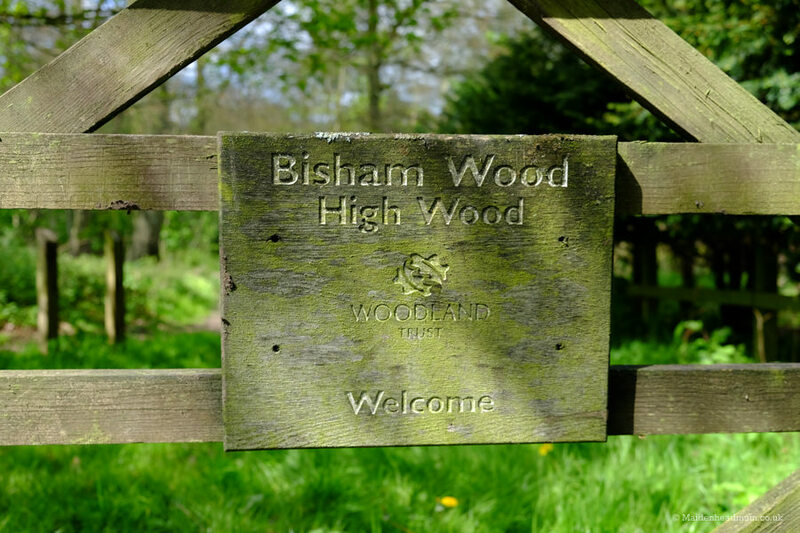 This year we went to the newly opened woodland areas at Ockwells park (Thrift wood) and also went to Bisham Woods. 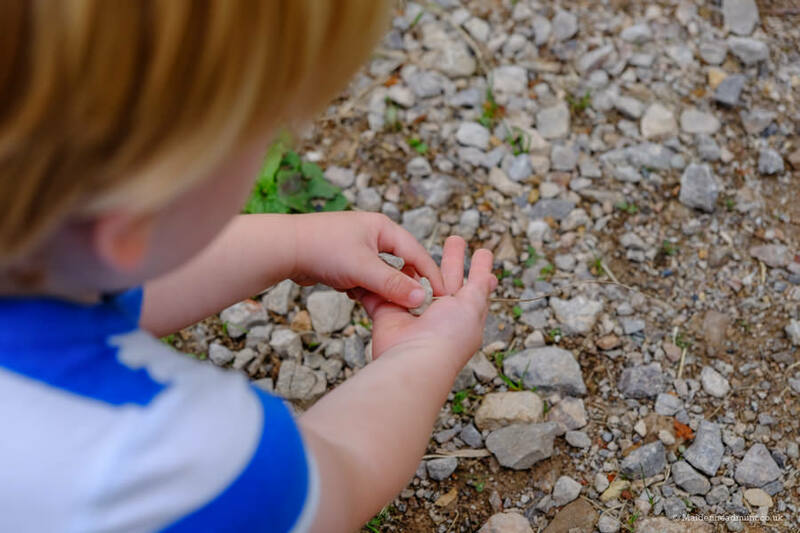 My son enjoyed the chance to roam freely along the paths, collecting sticks, touching the flowers and blowing the dandelion seed heads. I loved the opportunity for a family photo shoot too. 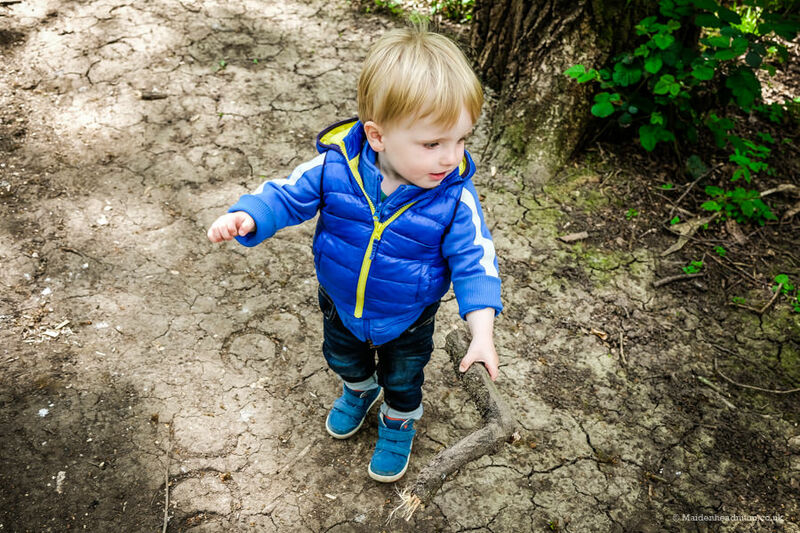 Some of the paths were wide and accessible in Bisham wood, but some parts were a bit tricky with the buggy. We always take a picnic with us because everyone seems to be STARVING by 11am! My husband is standing behind me making silly faces to try and get these two to smile at the same time! When we’re bored with all of the toys at home, getting out of the house keeps both of them happy. 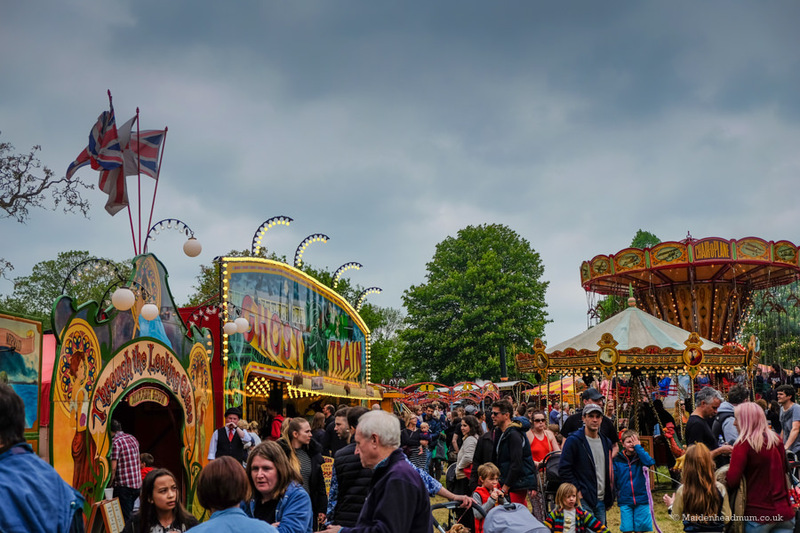 We are lucky to have Carter’s steam fair based right on our doorstep, and the fair comes to Maidenhead twice a year: once in May at Pinkney’s Green and then again in November at Boyn Hill Park for Bonfire Night. 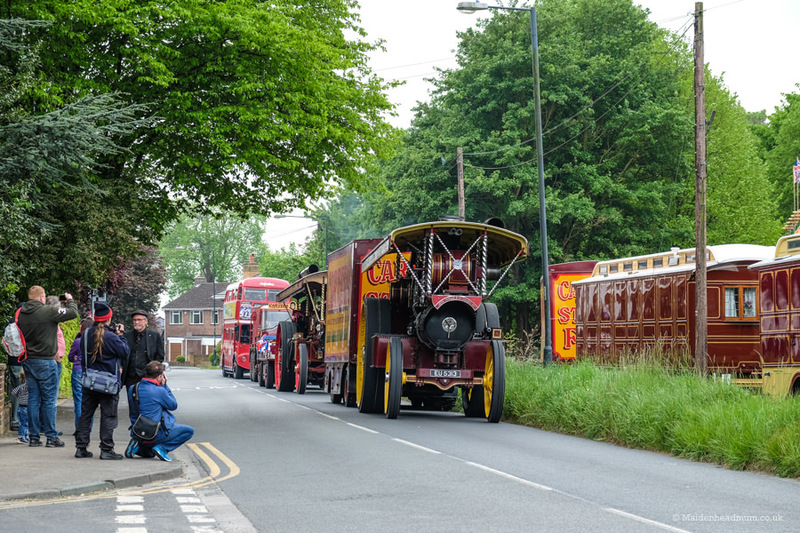 On the morning of the fair in May, the steam and vintage fair vehicles do a procession through town. Ever the budding explorer, I tried to follow this through town, but immediately got stuck in a traffic jam behind it all! Not so great for photos! 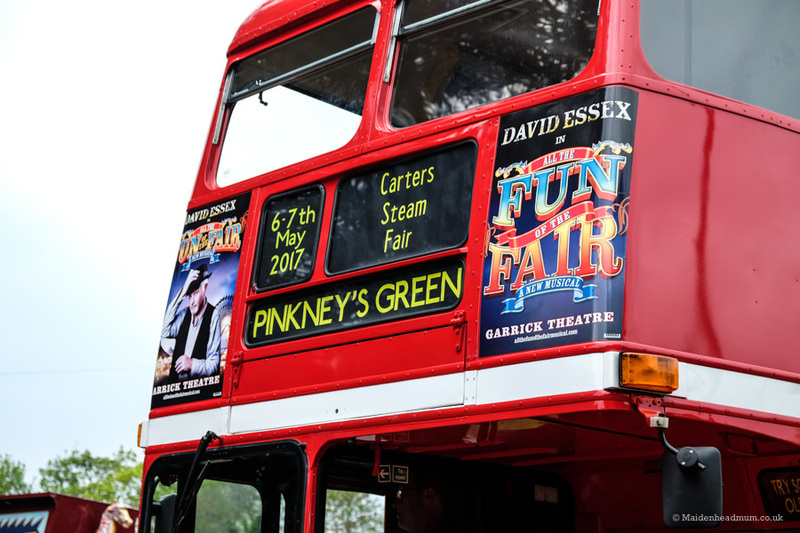 Instead, a much better way to experience it is to find a spot up by the fairground at Pinkneys and wait while the vehicles come back to refuel. Both my son and my five-year-old daughter loved seeing the trucks up close. They really are an impressive sight, and it’s a timeless thing to take them to see. Someone was VERY keen to see what all the noise was about! ok, not powered by steam, but still exciting to see a big red bus this close! Waving at the trucks. They have all been beautifully restored. Later in the day, we went along to the fair, but it was a little too busy for a two-year old that didn’t really want to stay in the buggy. 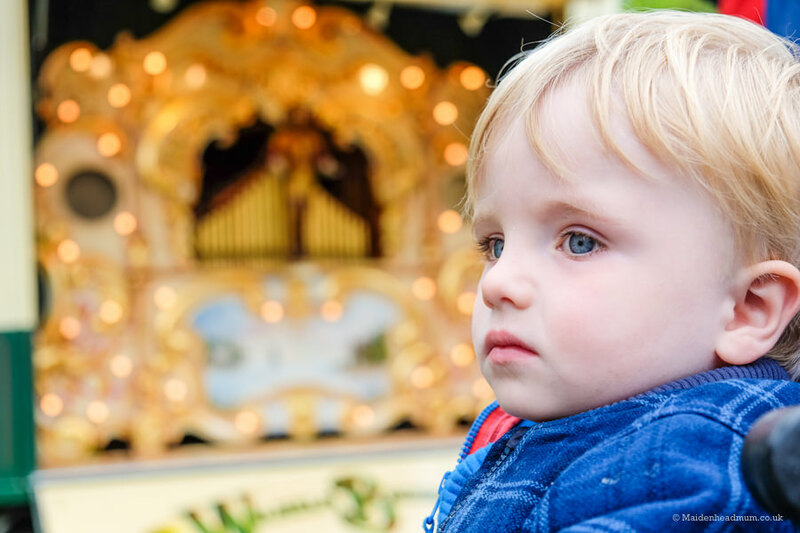 Go to the fair as early as you can to avoid the crowds if you’re taking a toddler. 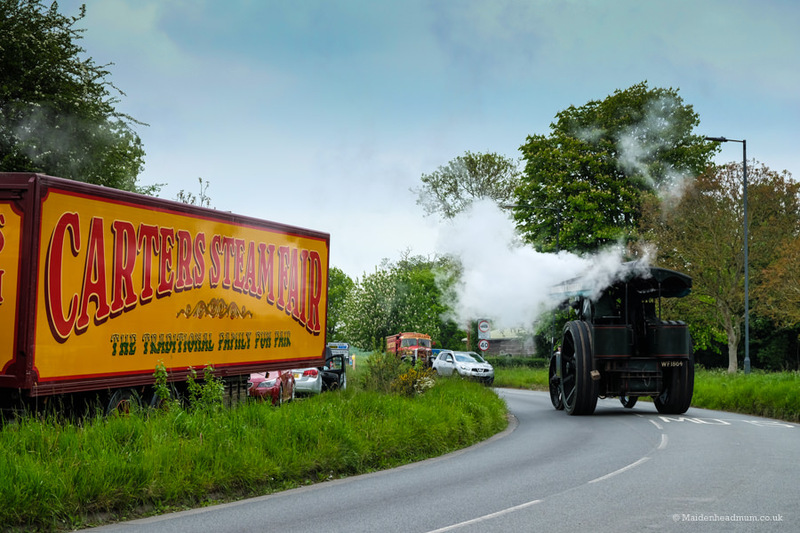 Check the website for Carters Steam Fair to get the details of the fair and the vintage parade times. 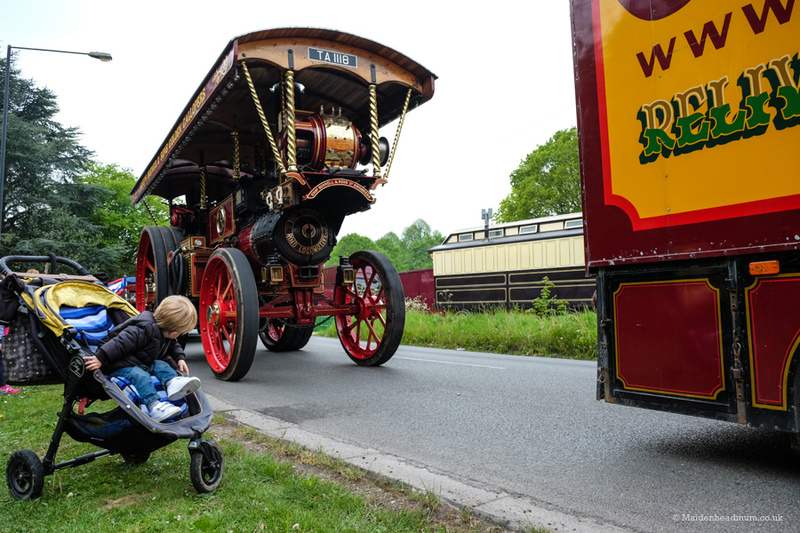 Carter’s Steam Fair was busy in the afternoon and not great with a buggy, but my 5 year old lots of fun! The music organ was lovely to listen too, and rather sparkly too! 10. Visit the birds and guinea pigs. 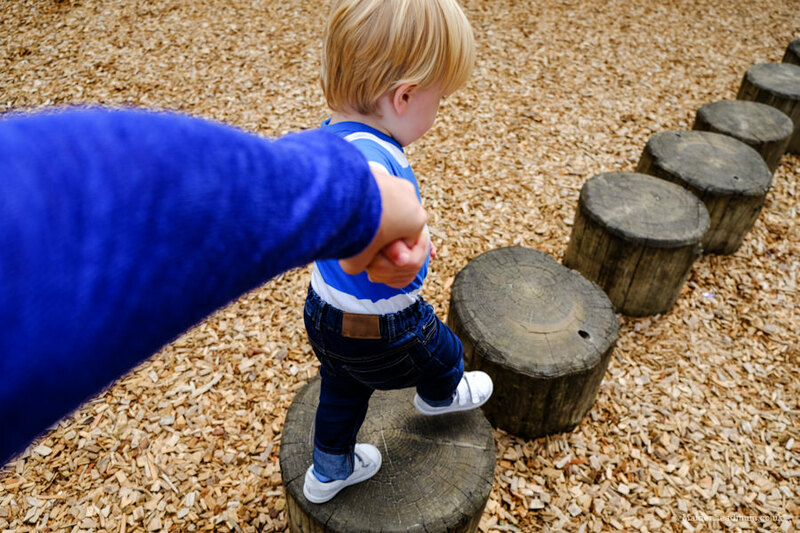 He likes to visit the birds and animals, climb on the wooden bridge, chase his sister around and run away from his Daddy whenever he can! 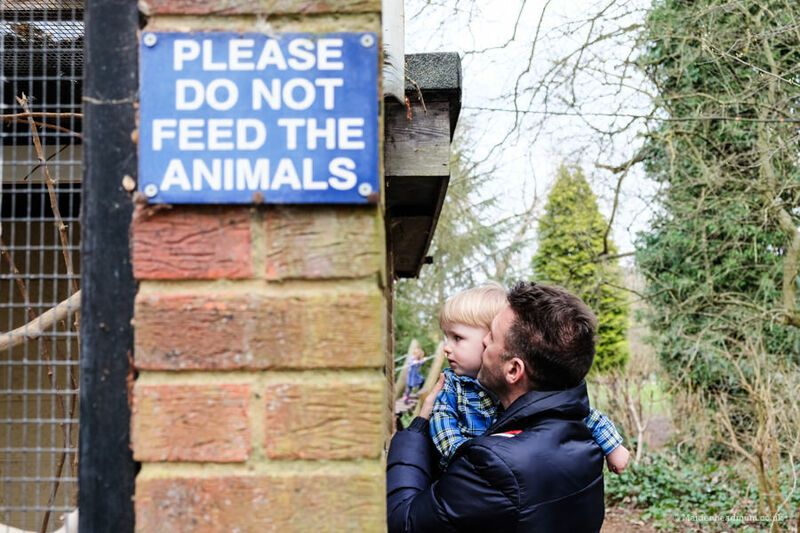 Right in the middle of Ray Mill Island there are guinea pigs and and an aviary. 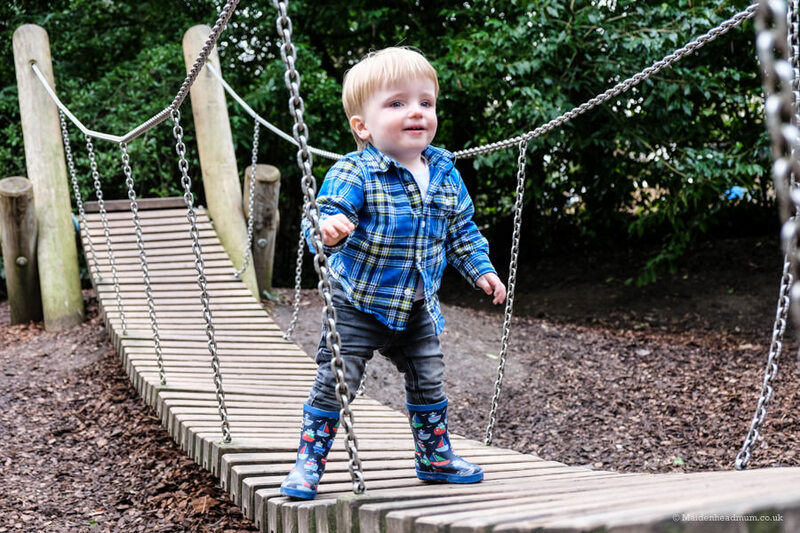 Jumping on the wobbly wooden bridge at Ray Mill Island. The look on my husband’s face as the Little Man runs off AGAIN! 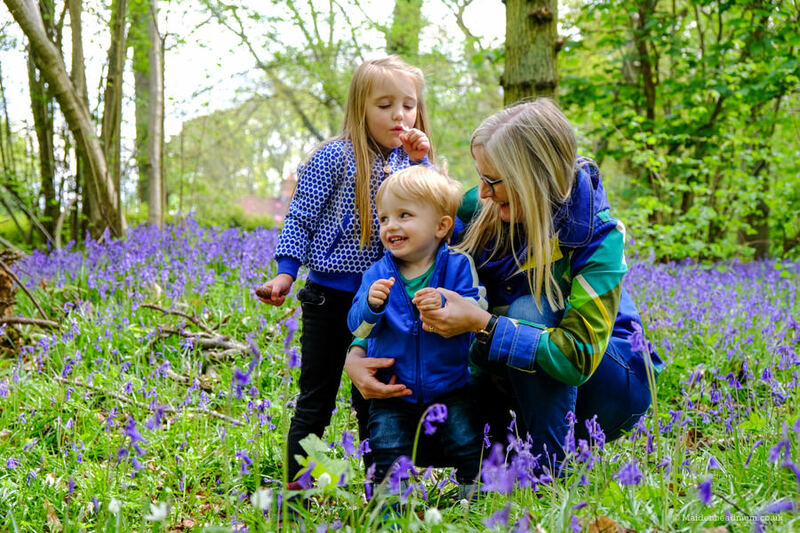 As mentioned earlier in the post, there is so much to do in and around Ockwell’s park that it deserves two places in our list. 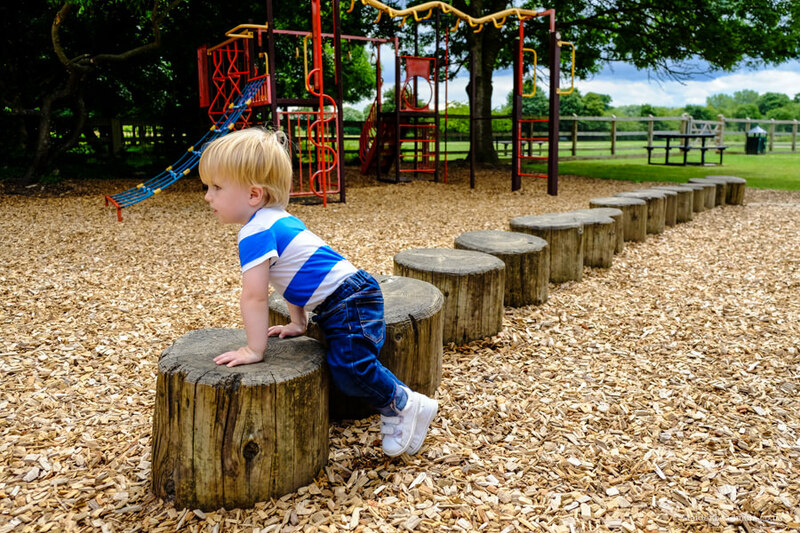 I find it a really close call for the title of ‘best park for toddlers’ between Ockwells Park and Oaken Grove, but I think the sheer variety of things to do at Ockwells tips the balance. 12. Build a winter sandcastle. It doesn’t have to be sunny to build a sandcastle! 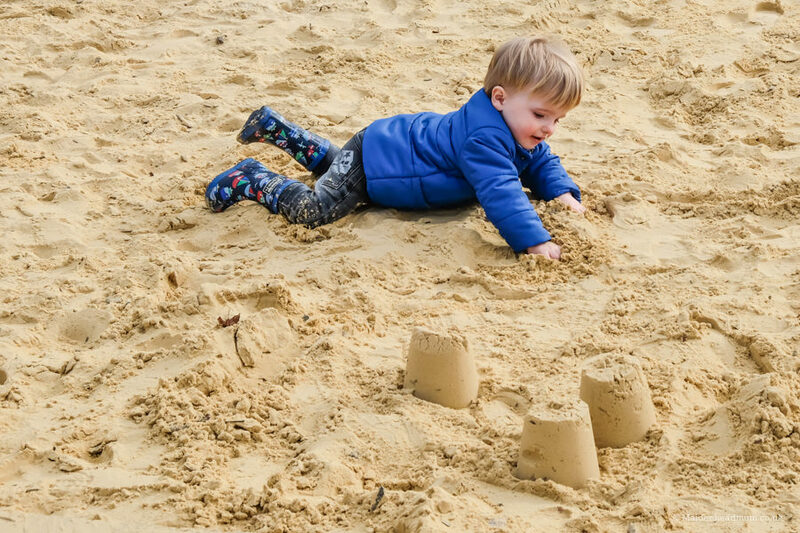 Maidenhead’s closest beach is a good couple of hours drive by car, but we have plenty of places where little ones can get their sandcastle fix. 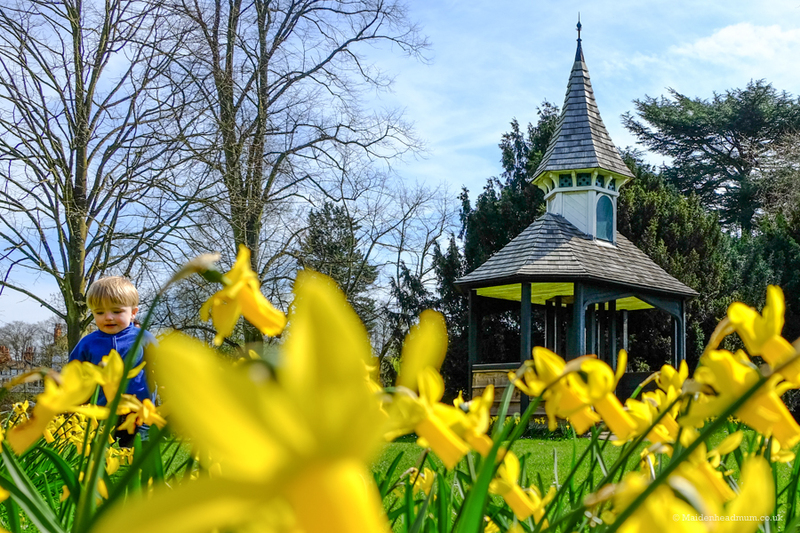 All year round you can take a bucket and spade to Riverside Park, Ockwells park and Oaken Grove and in the summer you can visit the beach at Norden Farm or the beach at Maidenhead Festival. 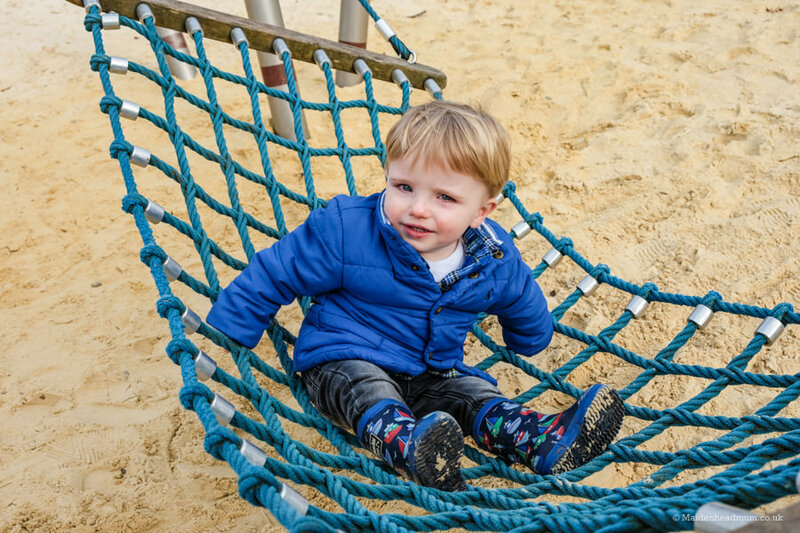 The sand and play area at the Riverside gardens is a particular favourite. We often took a picnic along in the middle of winter as it meant we could all just get out of the house. Playing in the sand without the peril of having to apply sun tan lotion to small children is also pretty liberating! 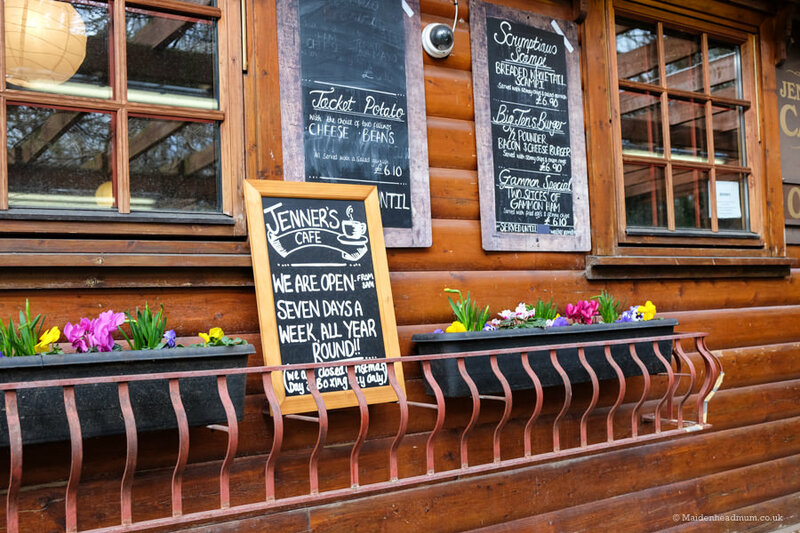 Jenner’s cafe is open rain or shine, perfect for a take away cuppa in the park, or a full fry up. 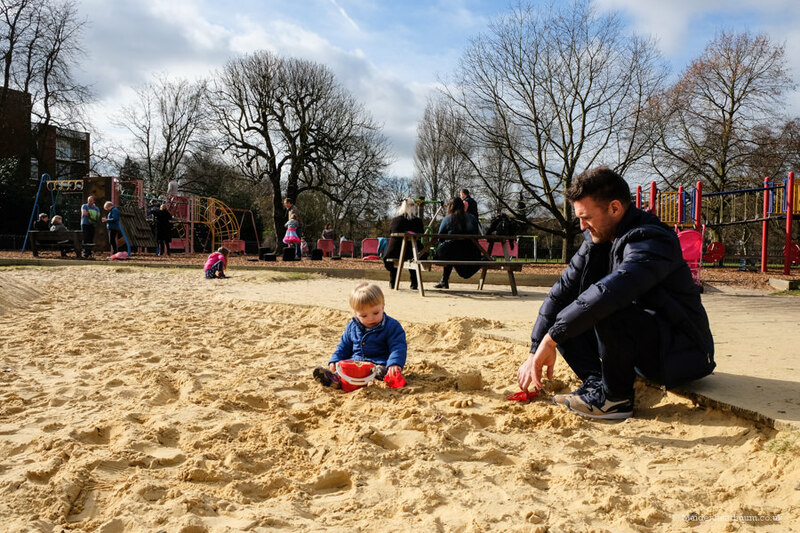 Riverside Gardens has a big sand pit, a play area and lots of picnic tables. 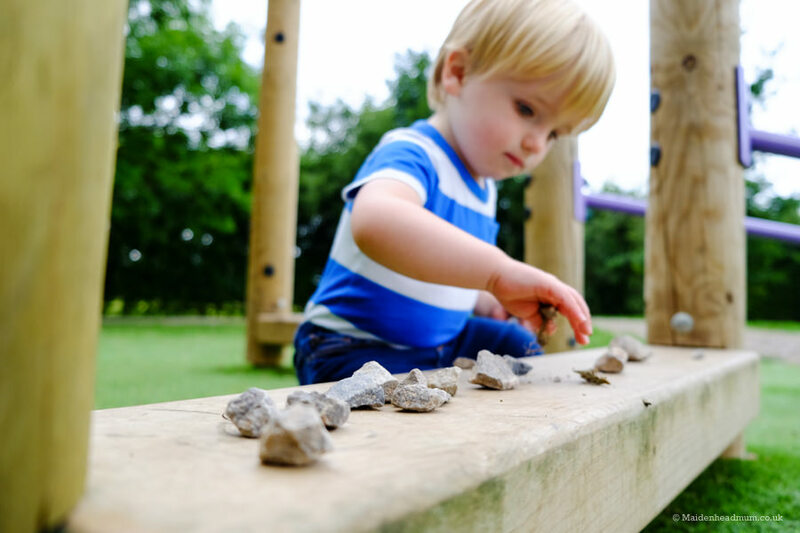 I hope you’ve enjoyed reading these ideas for children’s activities in Maidenhead. I’ve made a handy ‘pin’ in case you want to save this post to a Pinterest board. 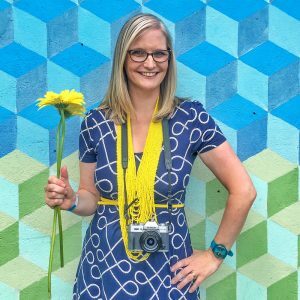 (You can also find me as ‘maidenhead mum’ on Pinterest and I’ve created boards for each day of the week full of all of the playgroups and baby classes in Maidenhead.